I understand the sensitivity in the issue of Michael’s costumes being sold. I am creating this blog because of the importance of history, and it’s a fine balancing act. 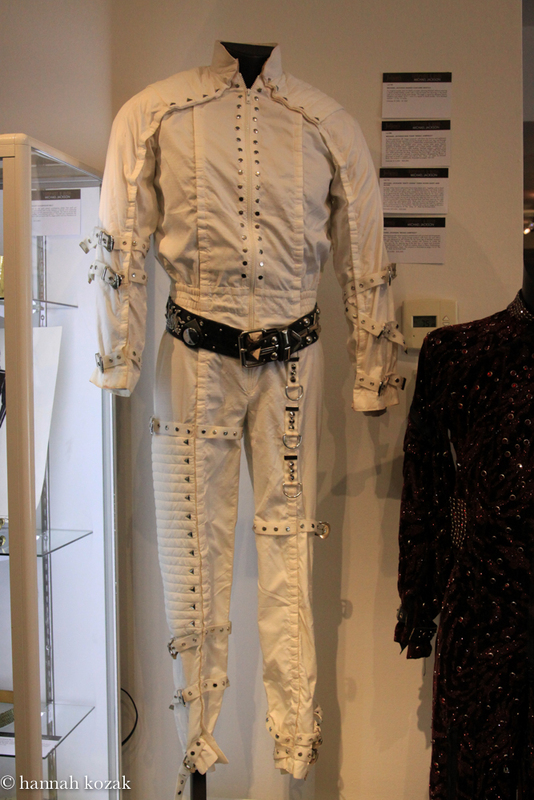 It’s important for me to stress that Michael Jackson was a dear friend to his costume designer, Michael Bush, who helped shape Michael’s vision and style and I’m sharing these photos in the context of celebrating that style. Aubergine sparkle velvet jumpsuit embellished with punched red thinestones, zippers and buckles. 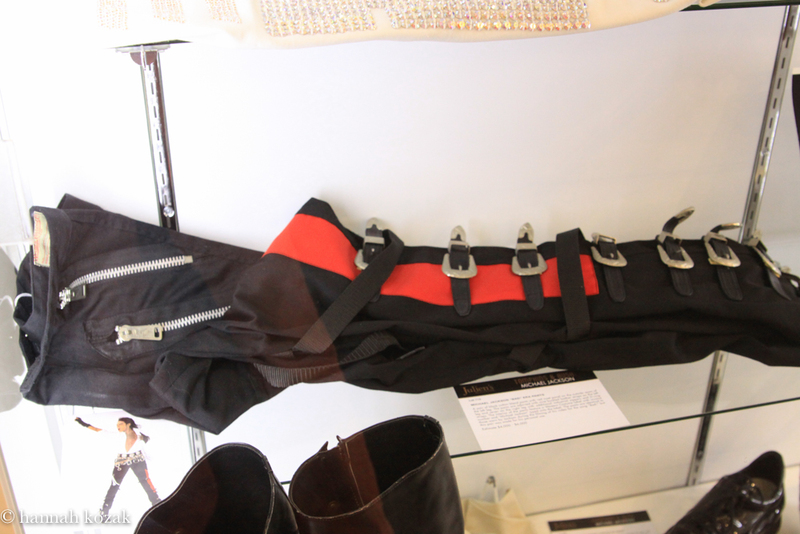 This quick-change jumpsuit w/front zip and velcro closures was designed by Bill Whitten for the Aisan leg of MJ’s 1987-1988 Bad World Tour. 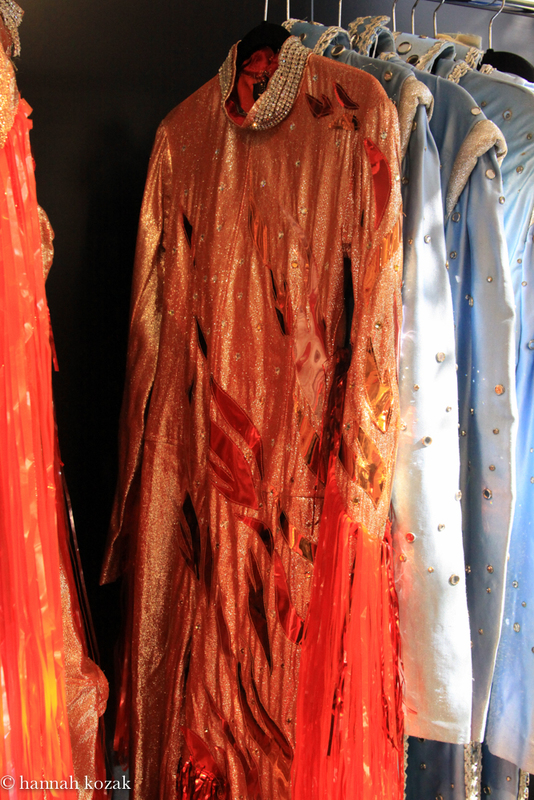 It was a great honor to photograph the costumes at Julien’s Auctions. I spoke to Darren Julien, who has a passion for auction since he was a young boy. Darren grew up one hour from Michael’s hometown of Gary, Indiana in a town called Goshen. He’s thrilled to be part of this presentation. Michael Bush decided to gift several of the items to the Estate of Michael Jackson so they can be preserved by the Estate as part of Michael’s legacy for decades to come. I’m grateful Bush recognized the historical significance of the costumes. I believe that the fans aren’t against Bush. It’s more that they are upset about what is happening to Michael’s possessions. Perhaps Tom Barrack, the steward of Neverland, will be able to purchase some of the items for sale.Fans from all over the world could visit Michael’s home to visit and enjoy. There could be an entrance fee and the money could be donated to one of Michael’s many charities for our children, for animals, for our planet. Made of rip-stop nylon, the same material used to manufacture parachutes. 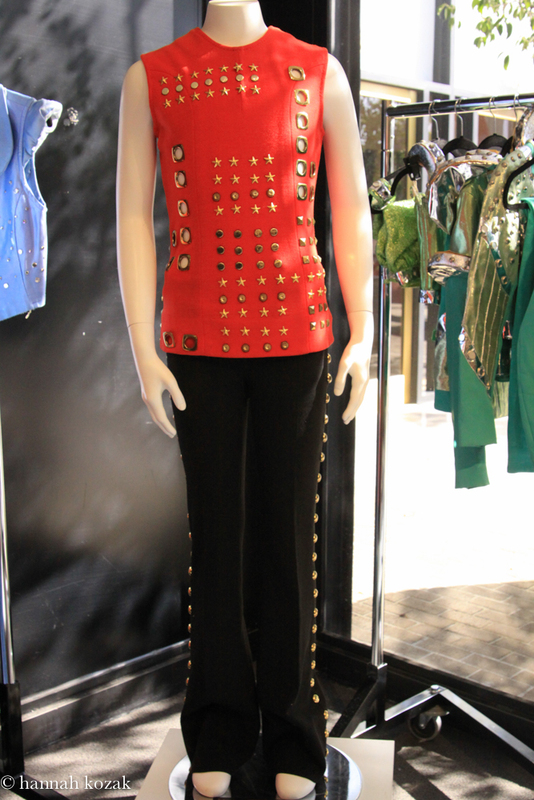 One piece costume was embellished with studs and a thick belt to create the effect of two pieces. Michael stepped into the suit, which zippered up the front. The entire outfit, broke away at four seams while remaining one large pice of fabric to reassemble in time for the next show. 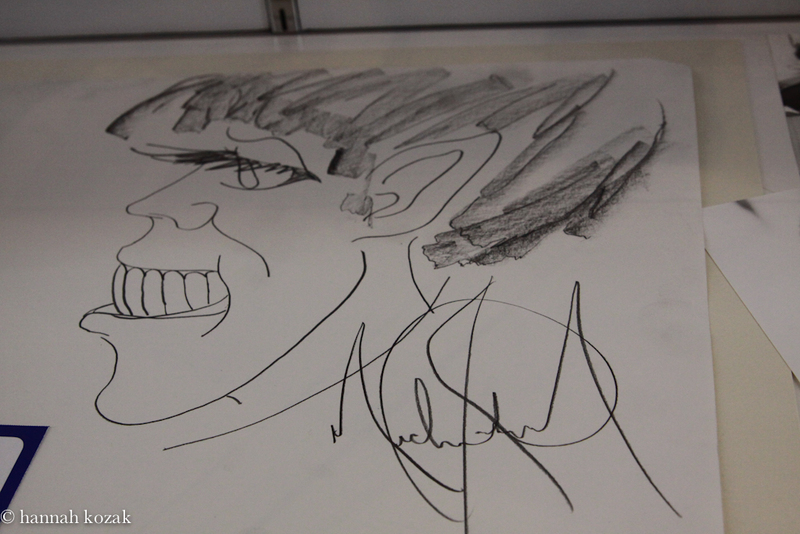 My favorite part of the auction was seeing the drawings that Michael created. 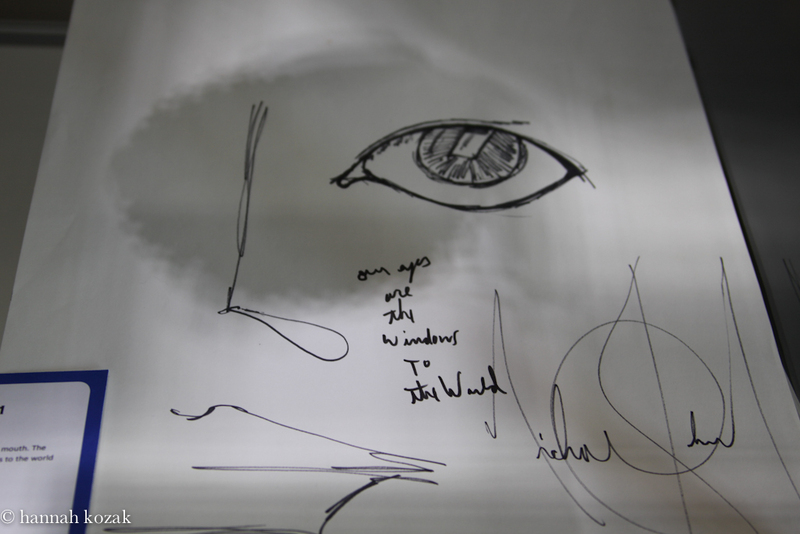 He’d “see” the outfit, draw a sketch and give that to his designers to create. 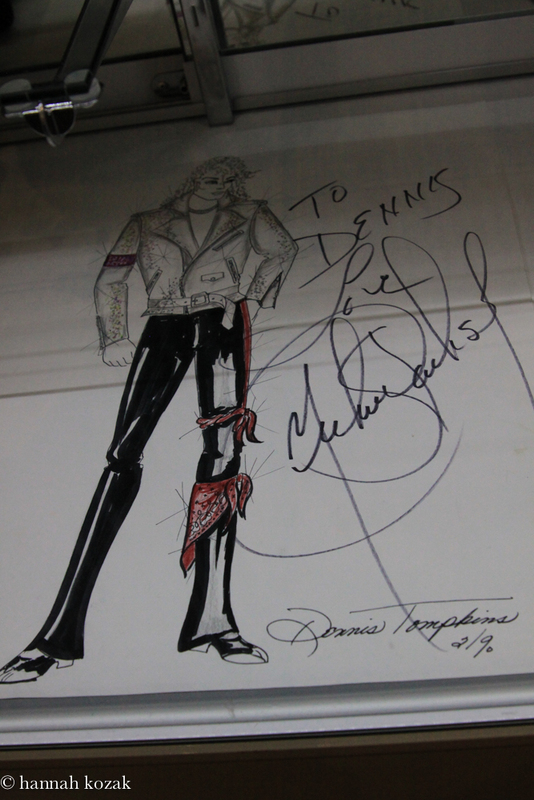 An original marker and pencil on paper sketch of MJ wearing a custom leather jacket. 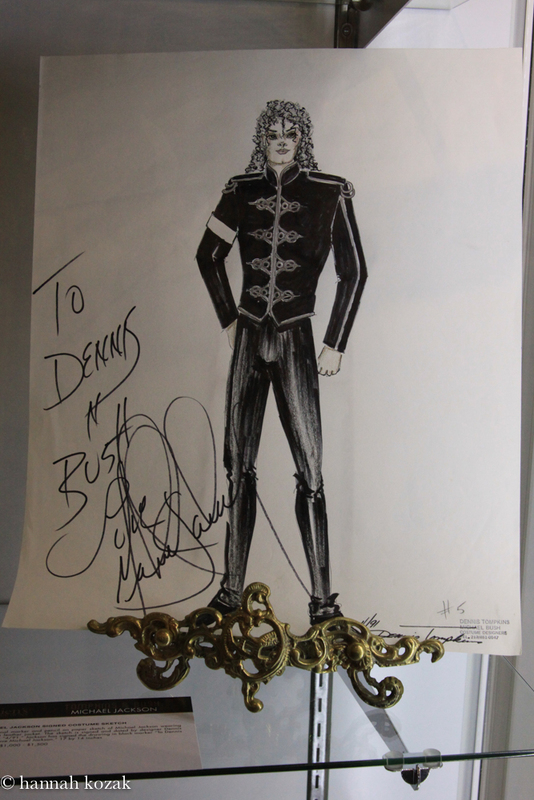 The sketch is signed and dated by designer Dennis Tompkins “4/91.” Jackson has signed the drawing in black marker “To Dennis & Bush Love Michael Jackson.” 17 x 14″. A leather lined gold lame belt covered in silvered bugle beads w/square iridescent Swarowski square crystal buckle, velcro & hook and eye closure. 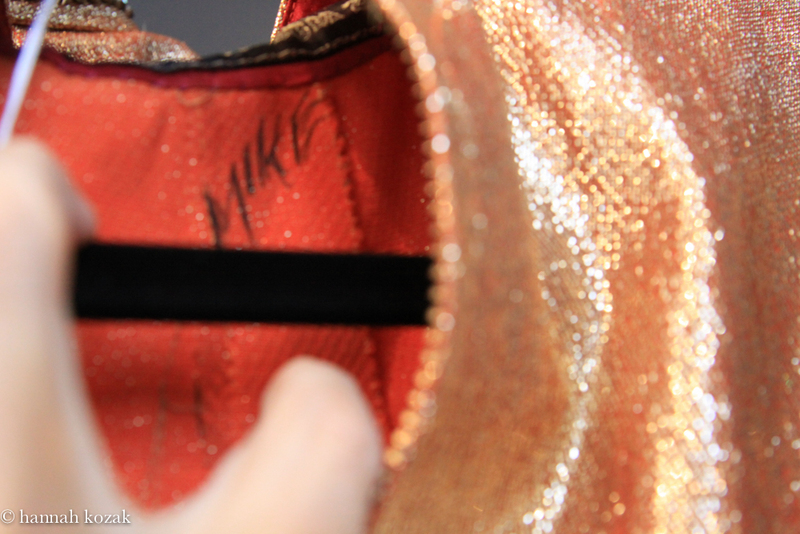 The interior of the belt has “Michael” handwritten in black marker. 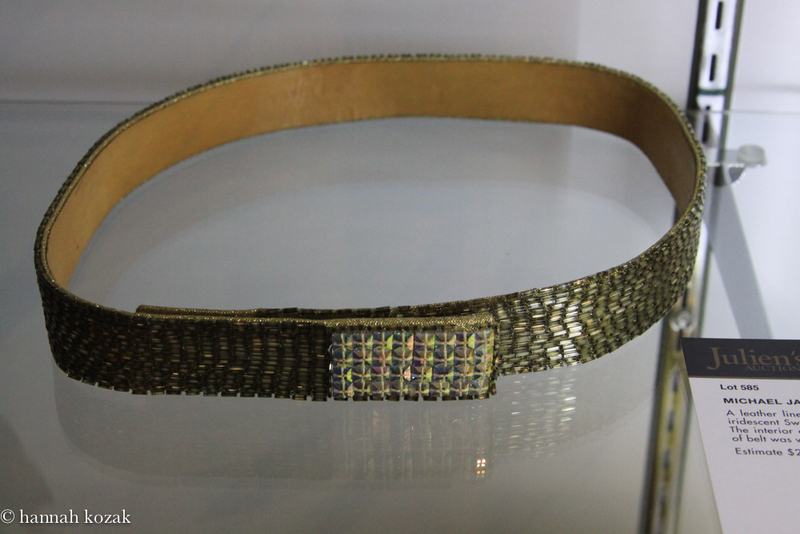 This style of belt was worn by him during the Jacksons’ 1984 Victory tour. A custom created gold helmet w/silvered sliding visor. 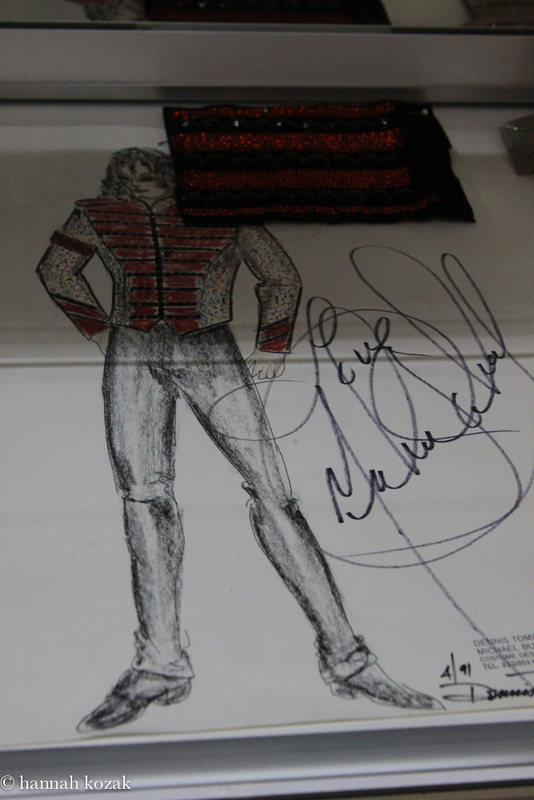 The futuristic helmet was created for the opening of Jackson’s 1997-1997 HIStory World Tour and is signed in red marker “Love Michael Jackson.” The concept behind and creation of this costume is discussed at length on pages 148-151 of The King Of Style book. 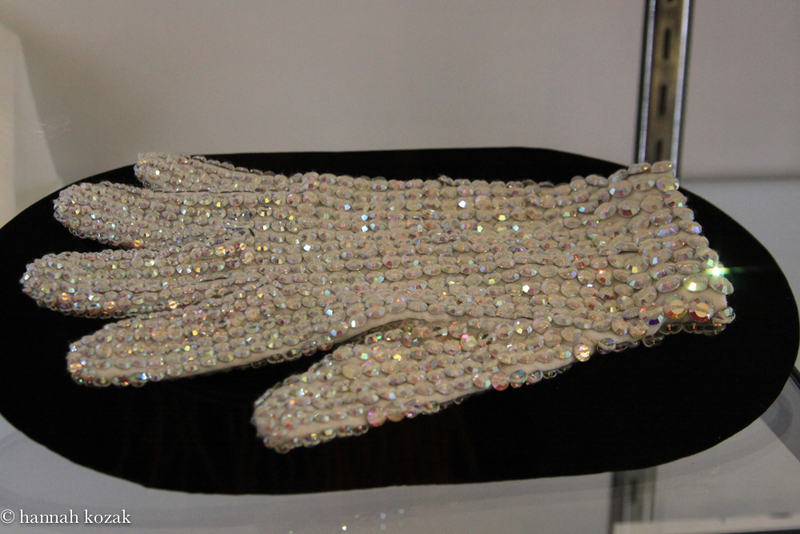 A piece of white stretch fabric with hand-sewn Swarovski crystal loch rosen, in the process of becoming one of Michael Jackson’s gloves. The work-in-progress offers a unique look into the process of creating one of Jackson’s iconic gloves. The hand beading takes more than 72 hours to complete. The components are then cut and hand sewn. 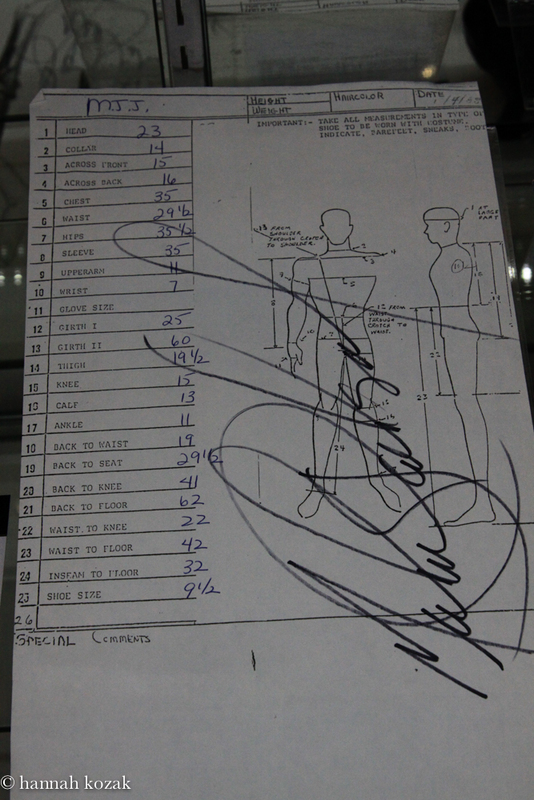 The fabric is signed in black marker “To Bush Love Michael Jackson.” This process is described in detail on pages 32, 33 of The King of Style. 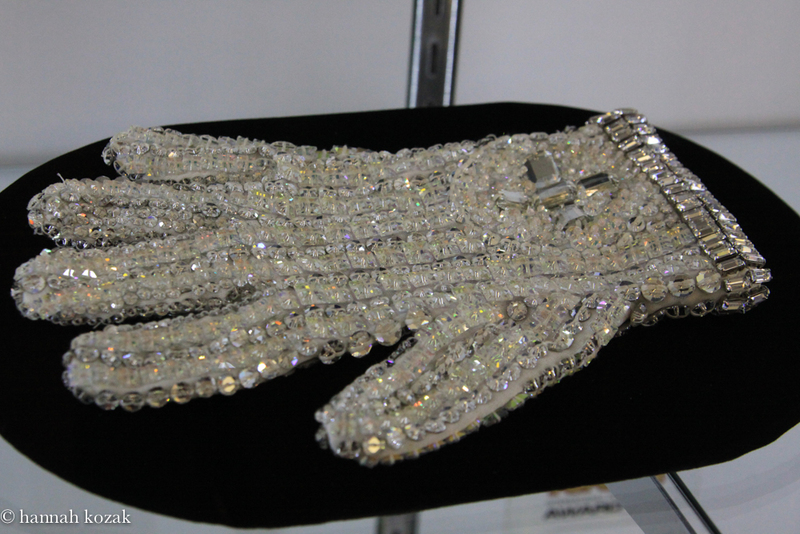 A white cotton right-hand glove with snap closure at wrist and interior label reading “Dennis Tompkins and Michael Bush.” The glove is completely covered in hand-sewn Swarovski loch rosen crystals of various sizes. 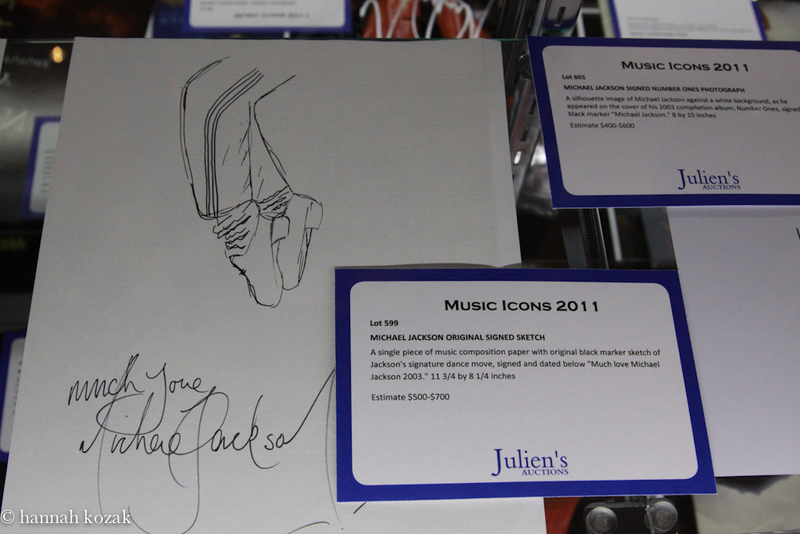 The glove was created for MJ by his longtime costumers. 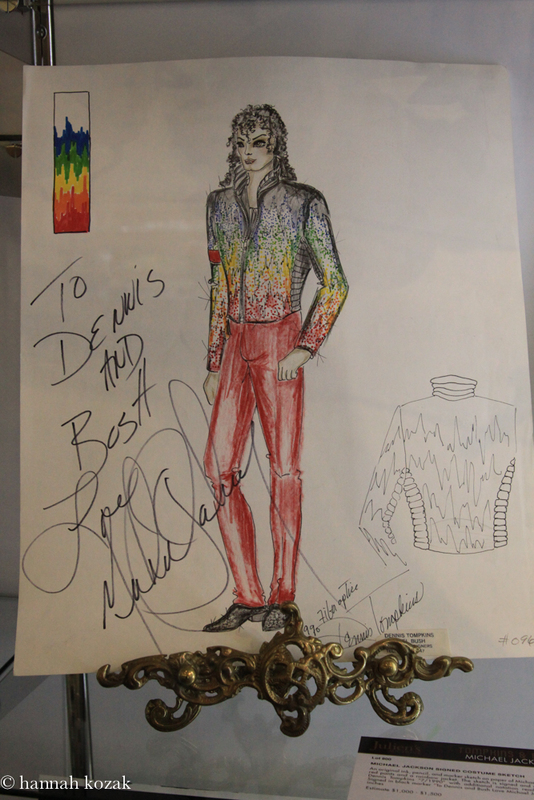 An original ink, pencil, & marker sketch on paper of Michael Jackson wearing red pants and a rainbow jacket. 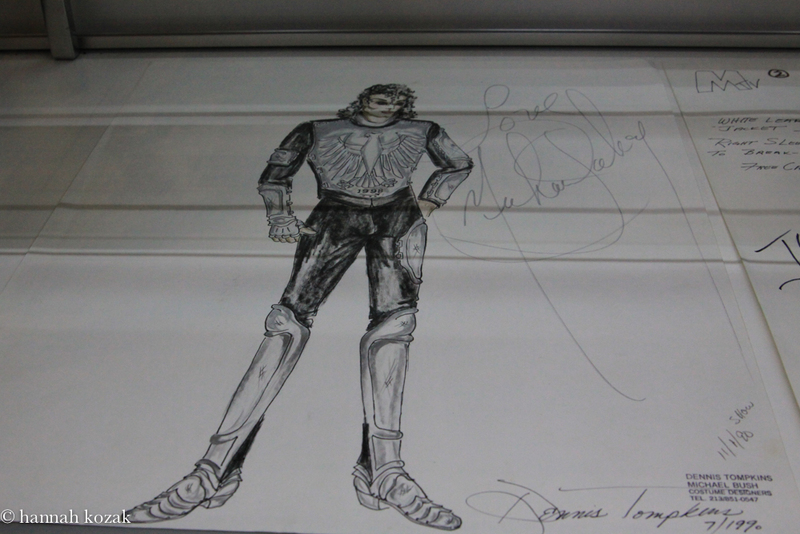 The sketch is signed and dated by designer Dennis Tompkins “7/1990” with additional notation reading “fiber optic.” Signed in black marker “To Dennis and Bush Love Michael Jackson.” 17 x 14 inches. 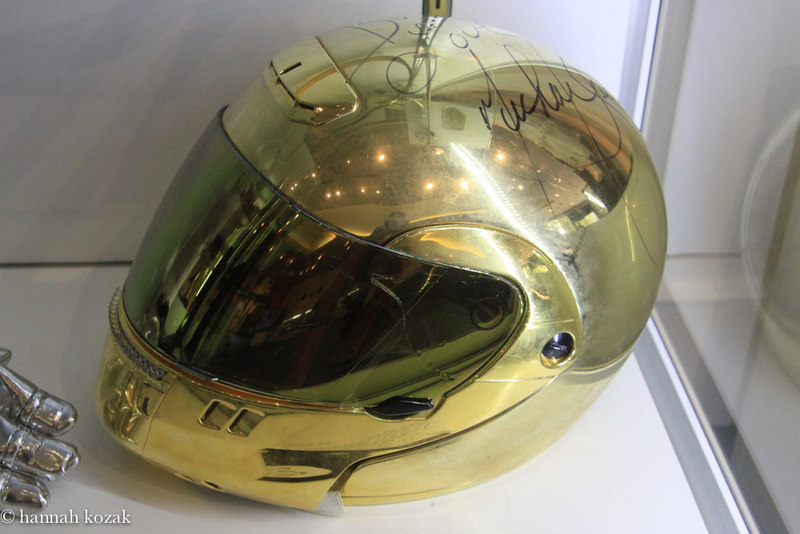 Gold painted fiberglass motorcycle helmet with mirrored plastic visor. The helmet has added styrofoam padding on interior and has been wired to illuminate a row of battery-powered lights below the visor. 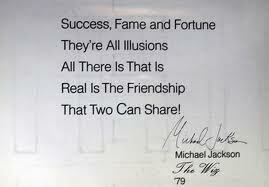 Signed “To Bush Love Michael Jackson. 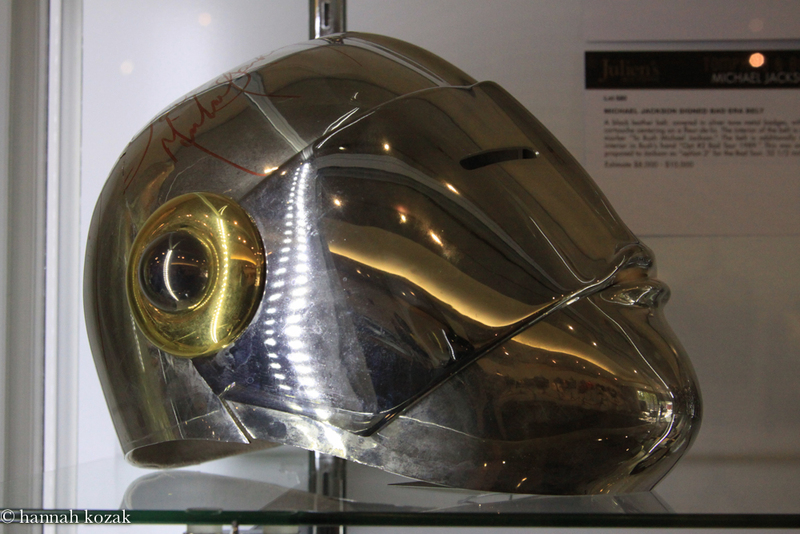 “Helmet was created for Jackson’s 30th Anniversary show at Madison Square Garden. 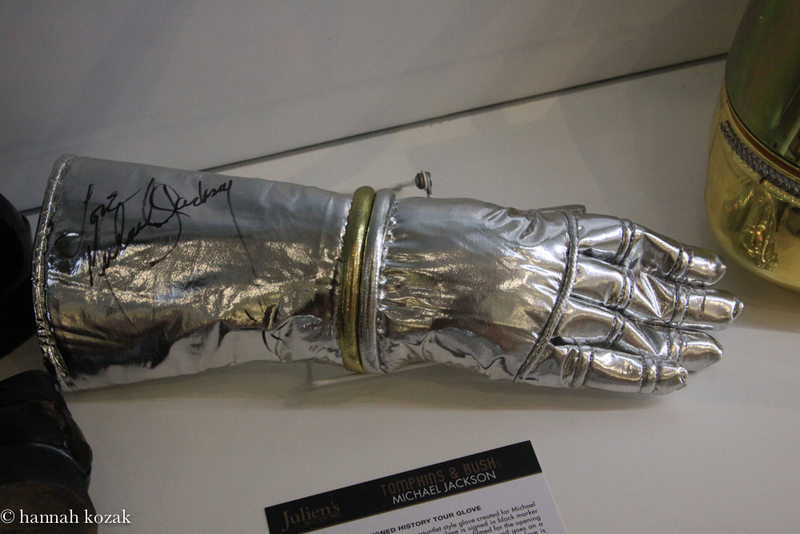 A silver and gold mirror finish spandex gauntlet glove created for Michael Jackson’s 1996-1997 HIstory World Tour. 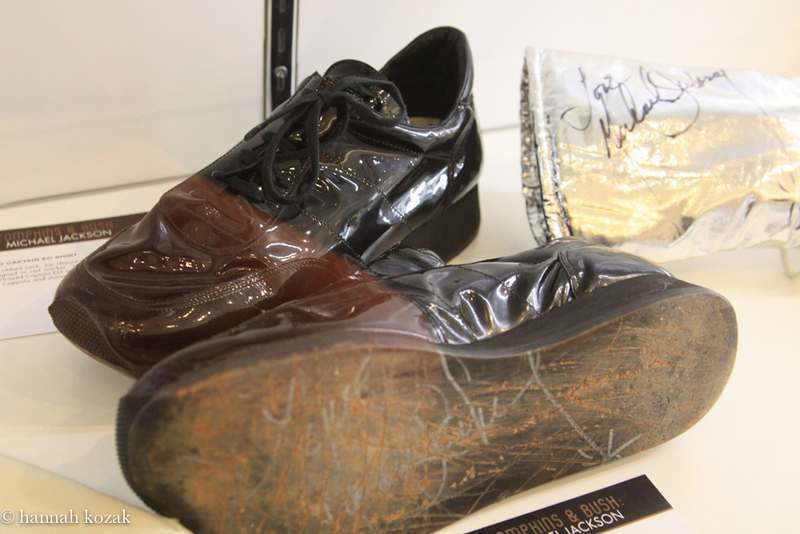 The glove is signed in black marker “Love Michael Jackson.” This glove appears in the video filmed for the opening of the HIStory Tour in which Jackson is launched in the rocket and goes on a journey through the history of mankind on his way to the show. Illustrated on page 150 of The King of Style. White spandex shirt featuring ribbed neck, zip closure at back of neck w/rainbow motif. 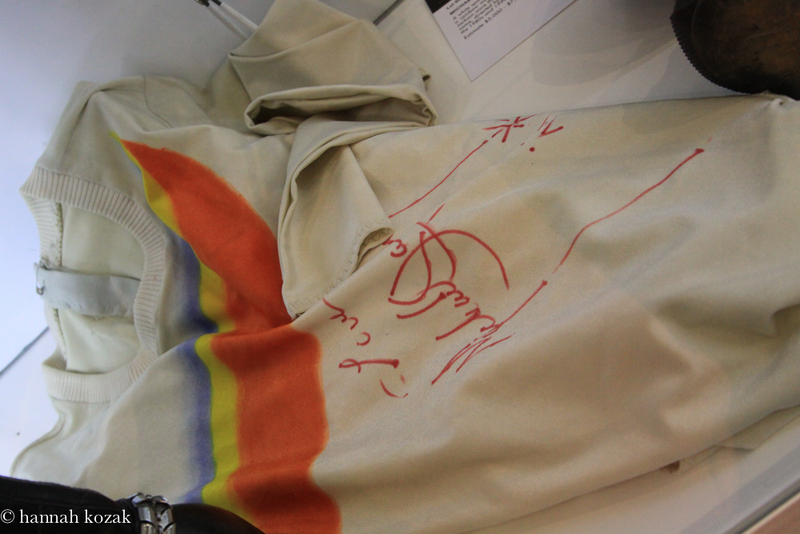 Signed in red marker “Love Michael Jackson.” Jackson wore this shirt when he portrayed Captain Eo in the 3-D film of same name, directed by Francis Ford Coppola at Disneyland in 1980’s and 1990’s. A pair of cotton blend pants with red inset panel on the outside seam of the left leg. Pants are adorned with nine buckled leather straps on the left leg & seven on the right leg with industrial zippers and D-ring straps. 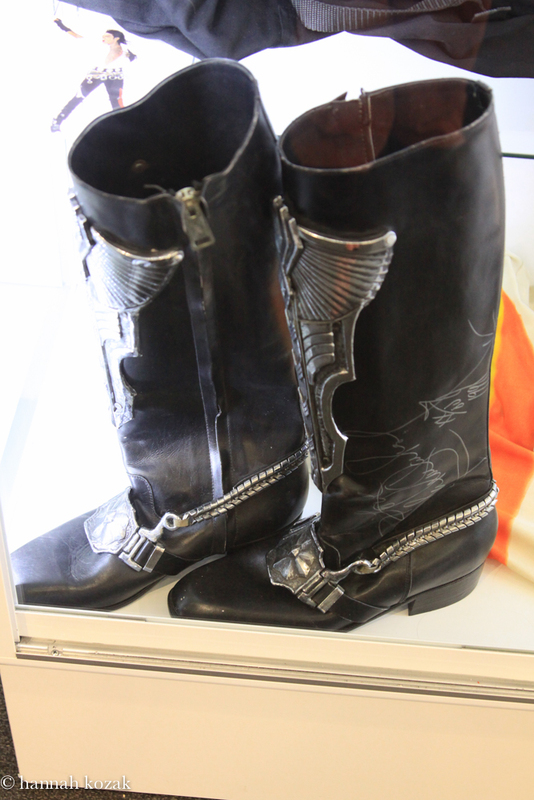 Pants are identical to those worn by Jackson during the filming of his video for “Bad”, but this pair was made for his personal use. A pair of black spandex pants together with a black synthetic blend avant grade shirt featuring elastic neck, waist, and cuffs covered with circular gathered puckers of fabric to create a three-dimensional effect. A black wool long-sleeve shirt with snap front closure and lined in black silk. The bib front, western style shirt is embellished white silk ruffle at cuffs and bib front, featuring gold tone metal buttons. 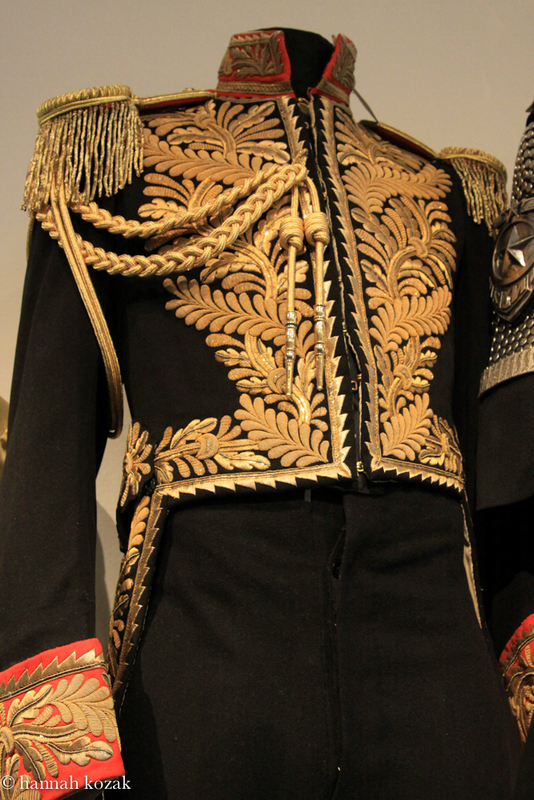 Collar and epaulets feature gold piping detailing with faux jeweled costume pieces on each epaulet. 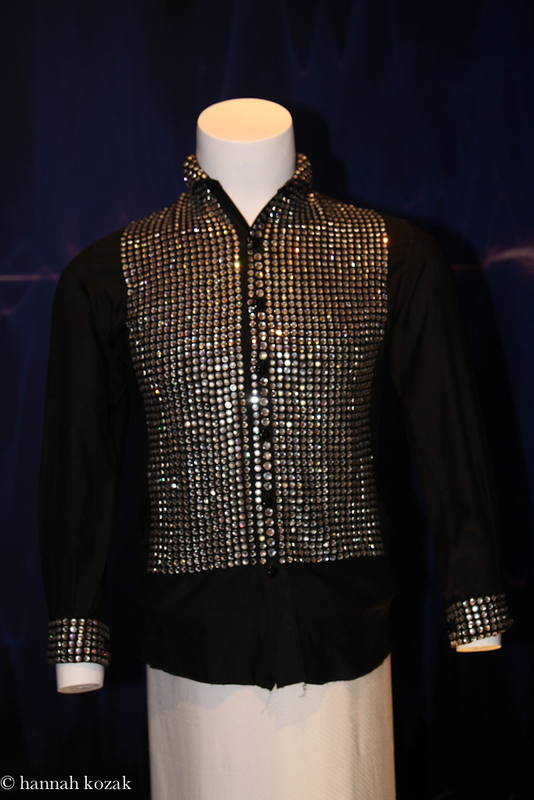 The jacket was made by Western Costume Co. Michael Jackson was photographed wearing this shirt with his longtime manager, Frank Dileo, in the early 1980s. A black wool jacket w/zip and velcro front closures. Jacket is heavily embellished with silver studs, braided metal epaulets, large silver tone metal badges at shoulders, metal plates over collar, white fabric armband with “777” in black and large metal bars across front of jacket. 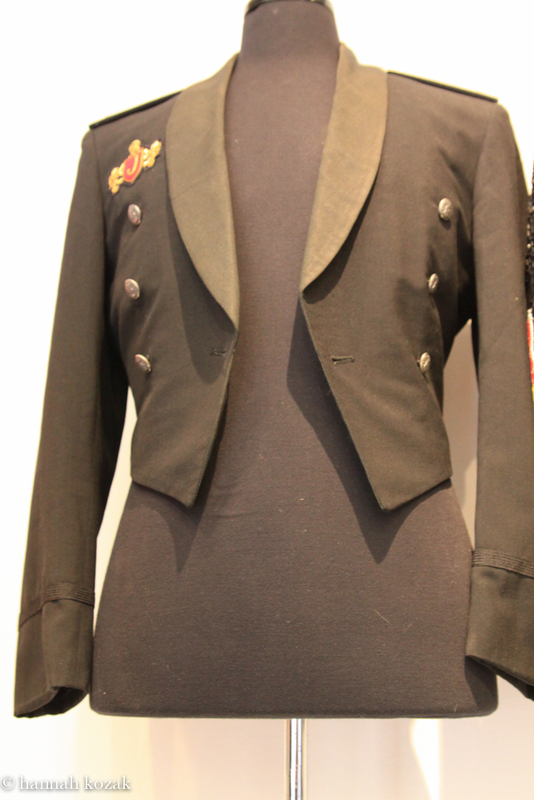 A black wool jacket with tails, featuring extensive gold bullion embroidery, red collar, cuffs and epaulets. Together with a pair of black wool pants with golden accented outer leg seams and interior label from Bermans and Nathans costumers of London. MJ wore this costume during a 1989 Vanity Fair shoot with photographer Annie Leibovitz for a cover article featuring Jackson. 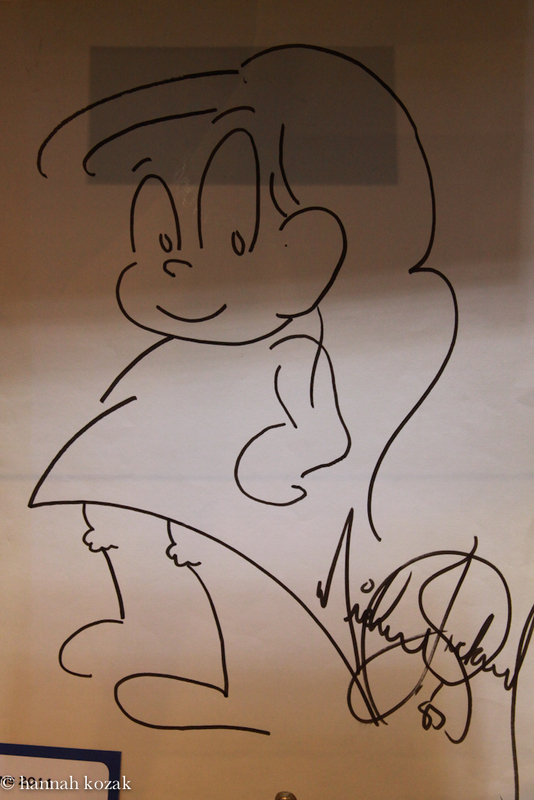 This sketch, signed by Michael Jackson, is my favorite. A pair of black metal sunglasses with mirrored lenses, worn by Michael Jackson during his 1992-1993 Dangerous Tour. 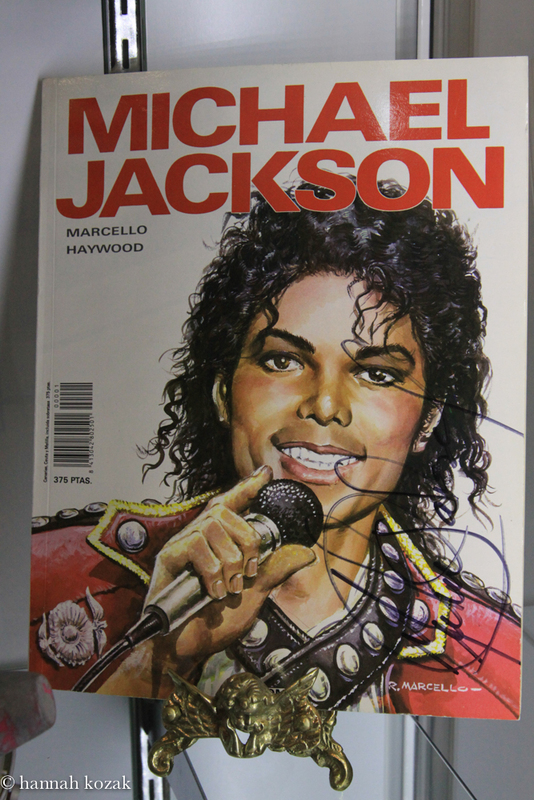 A spanish comic book entitled “Michael Jackson” signed on the cover in black marker. 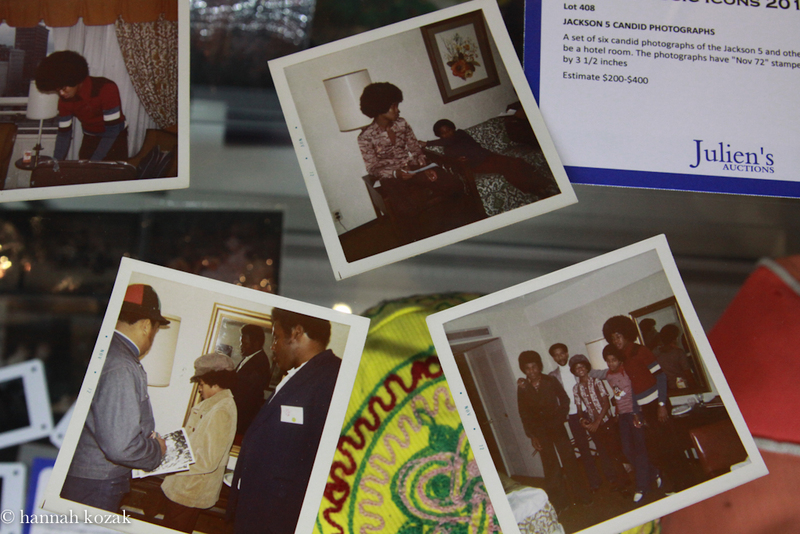 The 1988 comic book centers around Jackson’s life and features scenes from the Thriller video, The Jackson 5 era, The Wiz and Jackson’s life in 1984. A white spandex right-hand glove covered in alternating rows of Swarovski crystal loch rosen and square iridescent crystals on the back of the glove. The glove also features a round design centering on five large rectangular crystals and two rows of prong set rhinestones at wrist. Palm of glove is covered in loch rosen crystals of various sizes. Created by Bill Whitten in the early 1980’s. Known as fantasy gloves as they were alternative in color and design to Jackson’s signature white crystal glove. 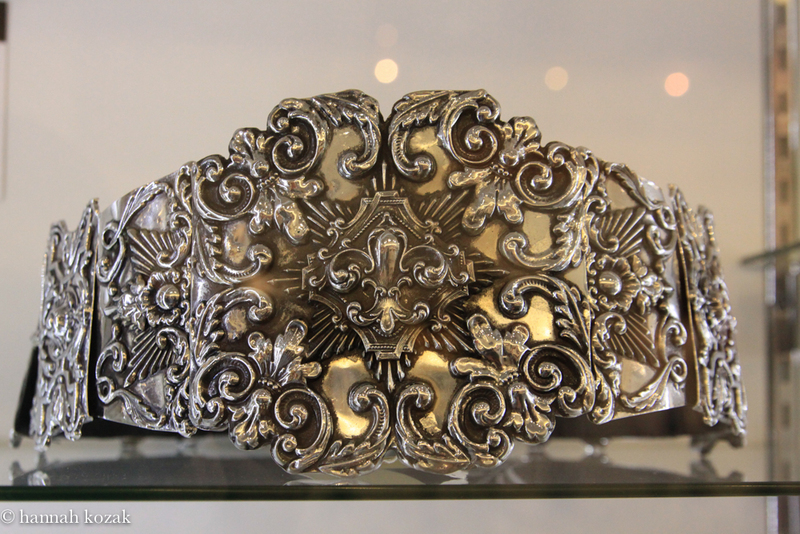 A full paper mock-up of “the story belt” created for MJ’s approval before the belt was carved and cast in solid silver. 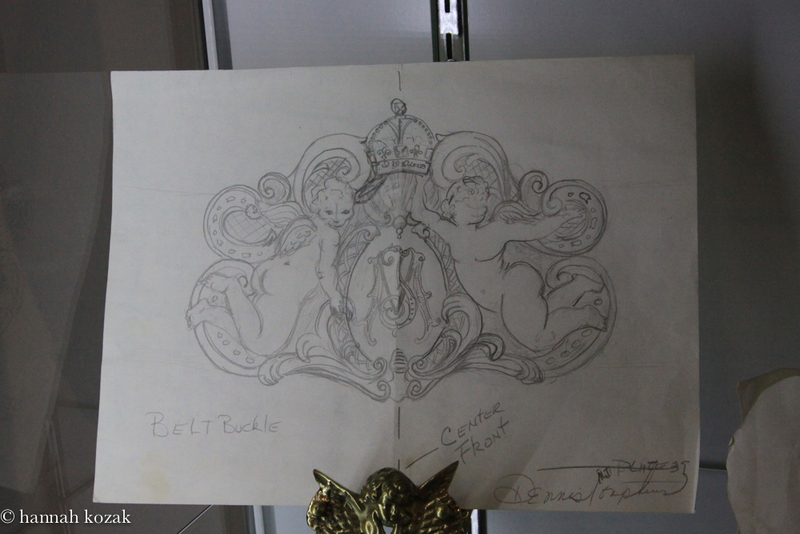 The belt featured a large central buckle with two cherubs flanking a crowned “MJ”. 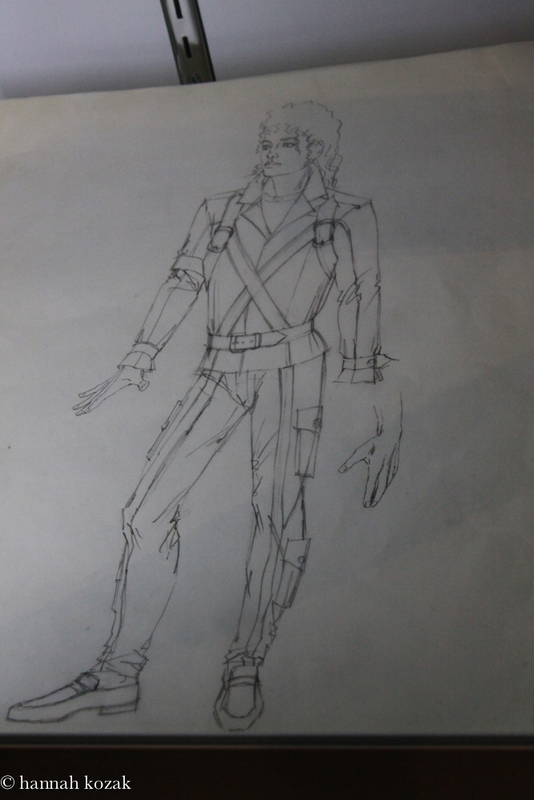 An original pencil sketch on paper of Michael Jackson wearing a military style jacket with loafters, unsigned. 17 x 14 inches. A black leather, silver studded belt that extends down the right leg with buckled straps. 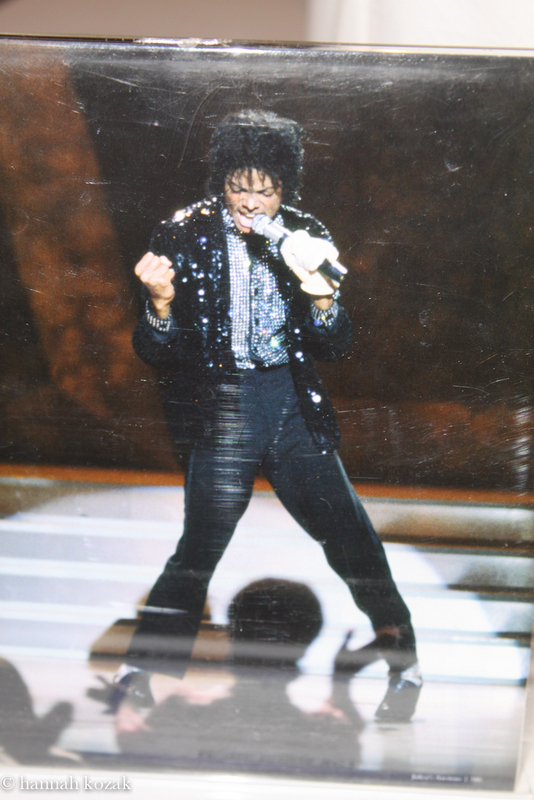 Belt was created for opening leg of Jackson’s 1987-1988 Bad World Tour. A black wool blend jacket with faux front zipper and Velcro, quick change, font closure. Heavily embellished with gold tone metal police shields at each shoulder, a metal armband on right arm and metal at collar. 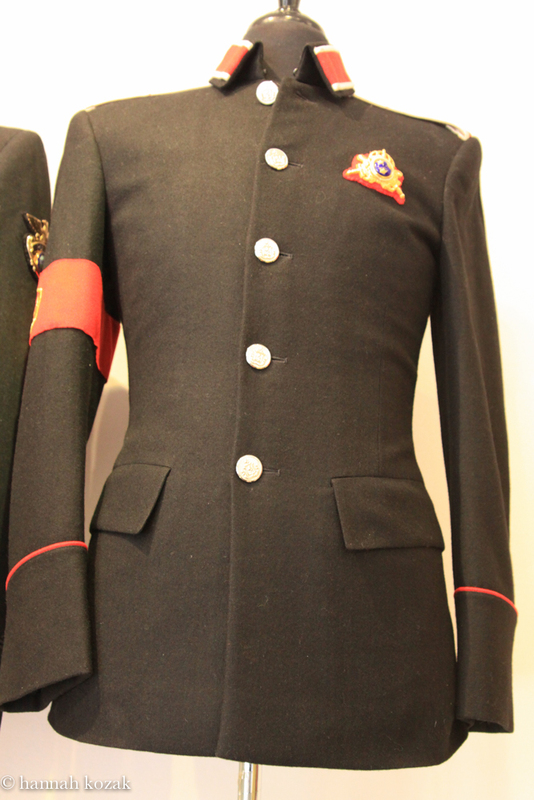 A black stretch gabardine, zip front jacket, heavily embellished with zippers at chest, five buckled leather straps on each cuff, buckled leather strap at waist, special officer badges at each shoulder, sterling silver rank markers at shoulders and collar, silver metal studs on epaulets. 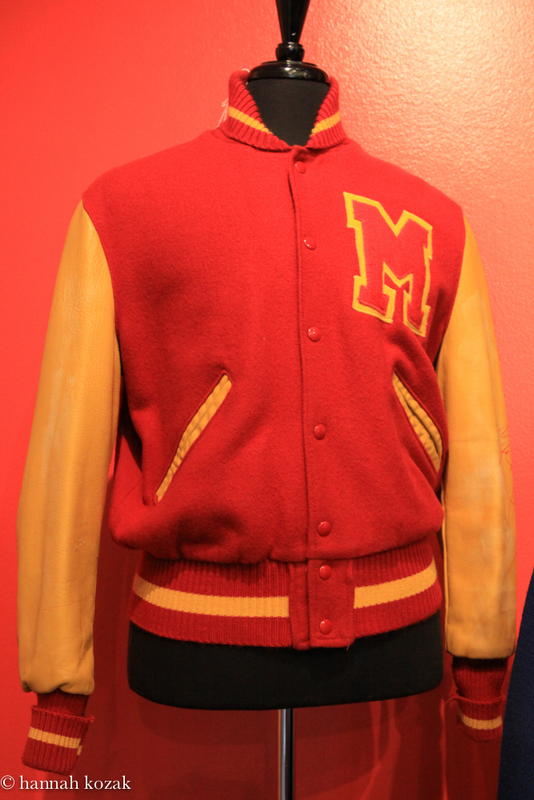 A red and yellow varsity style jacket with wool body and leather sleeves with knit cuffs, collar and waistbank. 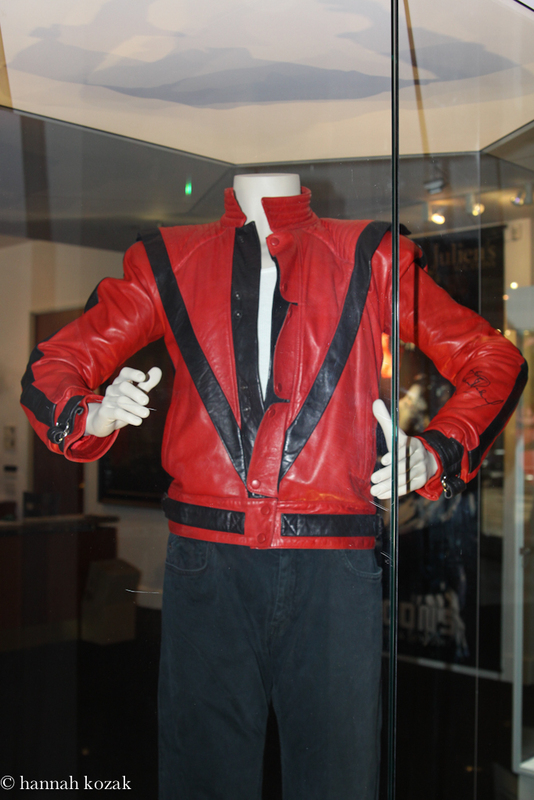 The jacket features a large “M” at chest and was worn by Michael as he transformed into a werewolf while performing Thriller live during the 1987-1988 Bad World Tour. The left sleeve of the jacket is signed in red marker. 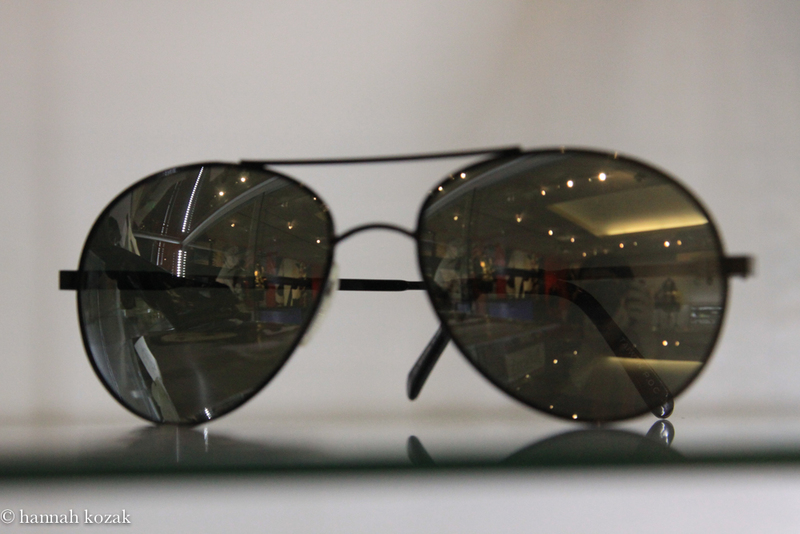 A pair of Ray-Ban Wayfarer sunglasses that have been gold plated, including lenses. 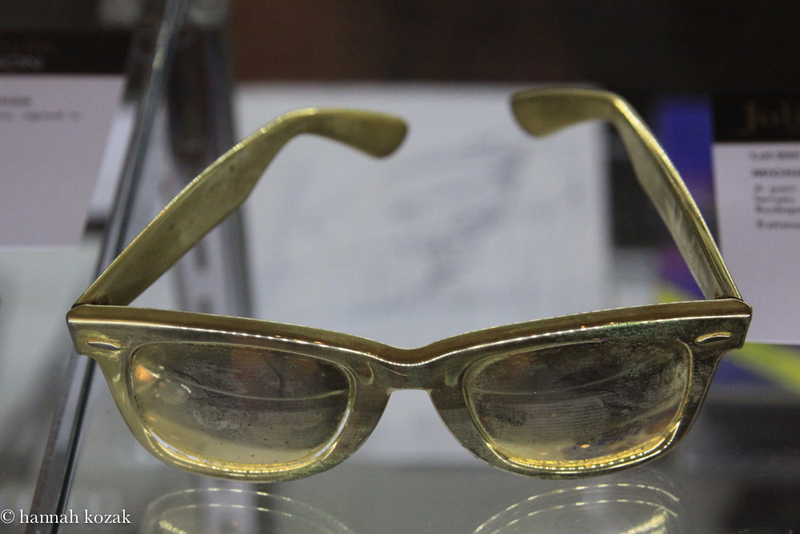 The glasses were created for Michael Jackson’s HIStory teaser, filmed in Budapest, but were not worn in the final film. 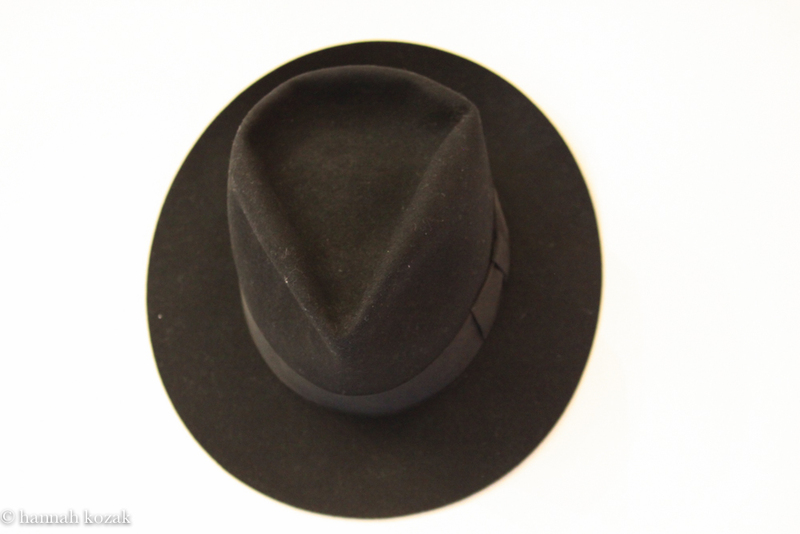 A Michael Jackson stage worn black felt fedora. 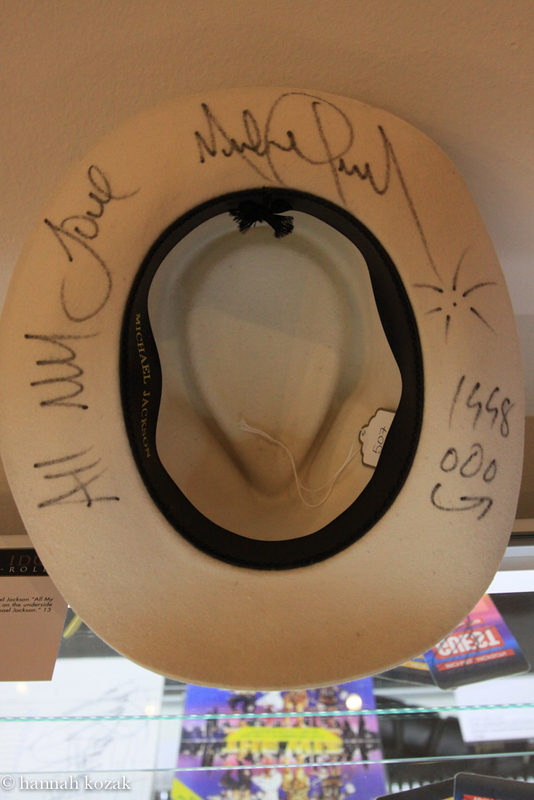 Stamped on interior in gold ink, “Michael Jackson.” The fedora was originally a gift from MJ’s clothing designer, Michael Bush to his friend, Pattie Maxwell. 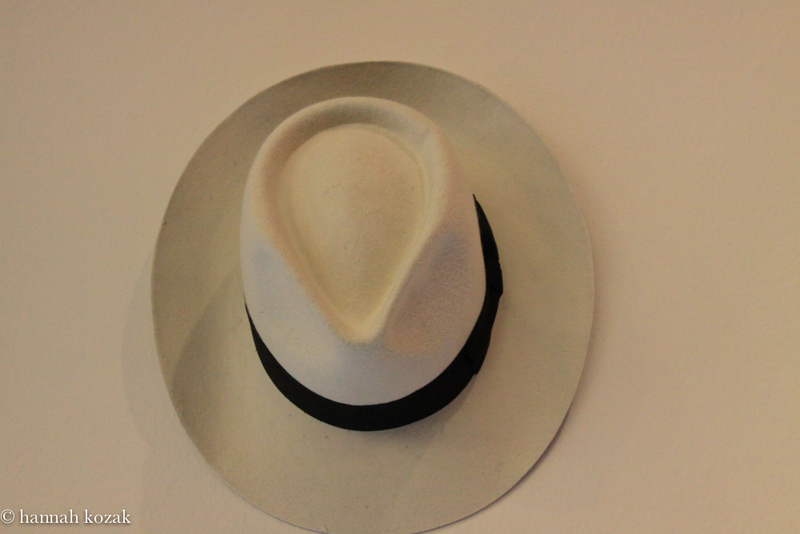 Maxwell sold the fedora to current owner. 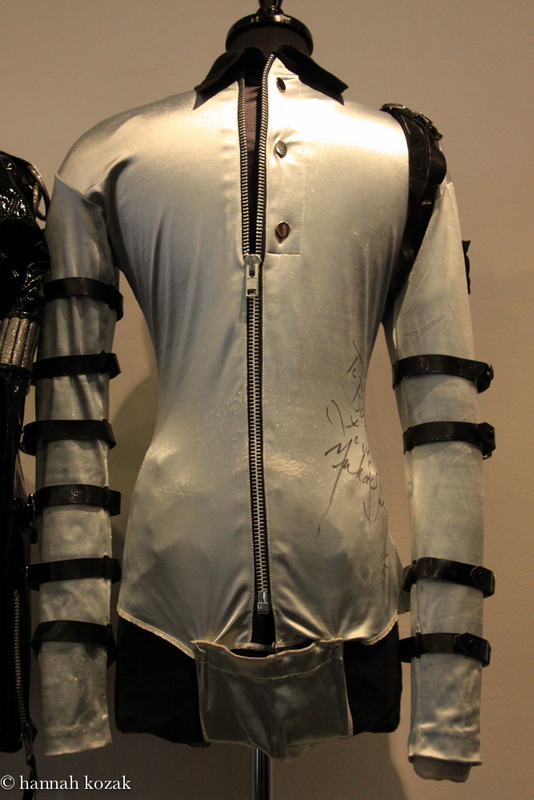 Silver spandex shirt with zip front closure, three silver buttons at chest, buckled black leather straps on both arms, tuck strap with snap closure, and silver tone metal “special officer” badges at each shoulder. 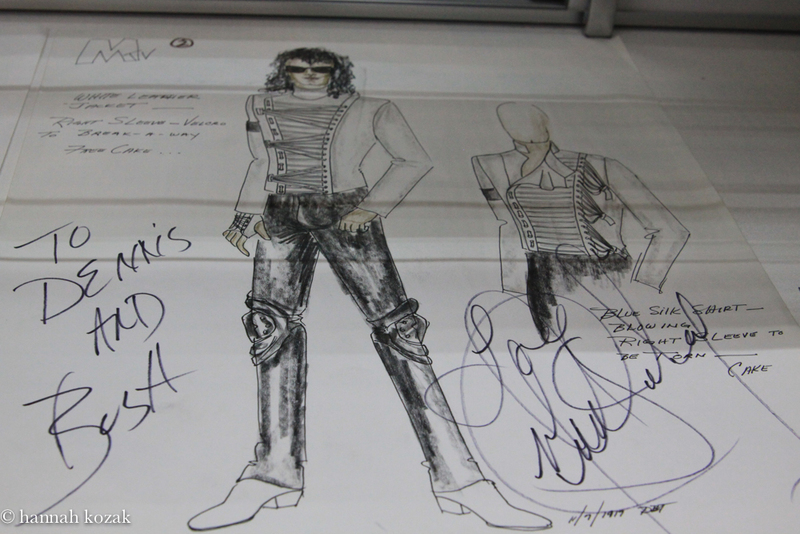 Michael wore this shirt on stage during the 1987-1988 Bad World Tour. A black patent leather motorcycle jacket with zip front closure, zip cuffs, matching belt at waist. The jacket is heavily embellished with a large embroidered Prussian eagle with central “M” crest on back and patches reading “Unique” and “MJ”, and an eagle holding an “M”. Jacket features a red patent leather stripe on left arm and silver embroidered armband on right arm. 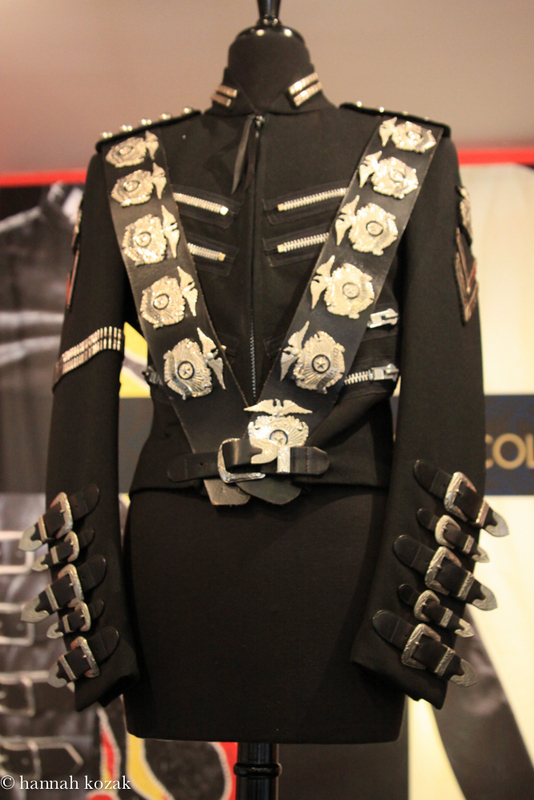 Michael was photographed wearing this jacket with Flavor Flav while attending an event in the 1980’s. A black wool double breasted suit jacket embellished with red armband, gold tone metal floral buttons, gold bullion embroidered crown patch at chest, buckled leather straps at right shoulder. 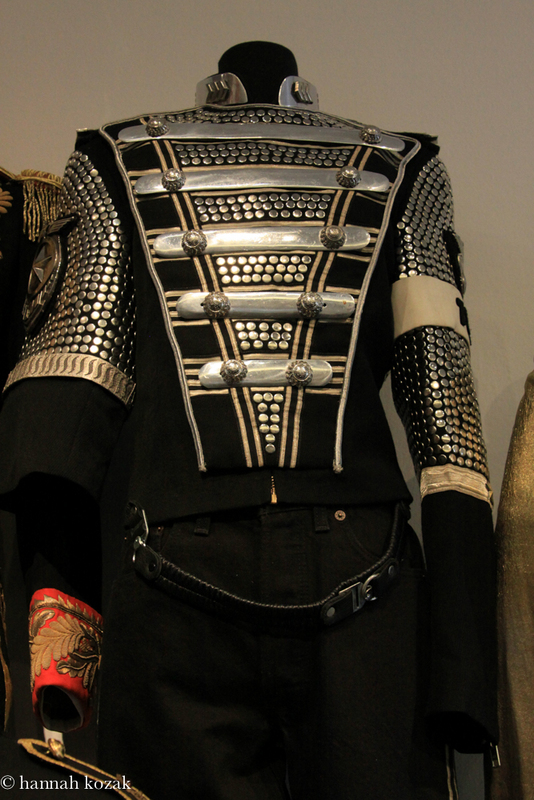 MJ wore this jacket during close-up shots of his four-part Pepsi commercial filmed during the Bad era. Jackson wore this jacket when he attended the 3rd annual Soul Train Awards in 1989. 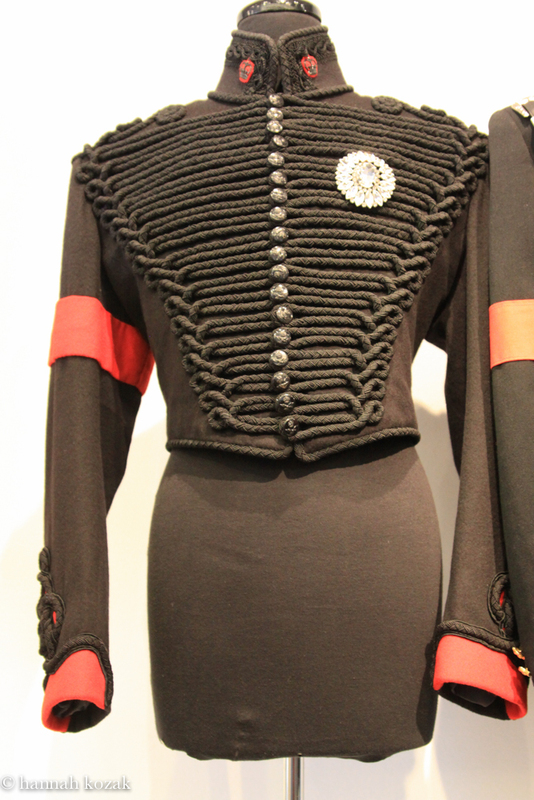 A black cashmere hussars jacket with red armband and cuffs. The front of the jacket is covered in black braided rope and additionally accenting the cuffs, collar and back of the jacket. Front of jacket has a long row of black, crown over eagle buttons, and the collar features black metal crowns over red fabric. Front of jacket has rhinestone brooch, signed “B&W” for designers Butler and Wilson. Michael wore this jacket when he visited the White House in 19990, when he was honored as Entertainer of the Decade by then President George H.W. Bush. 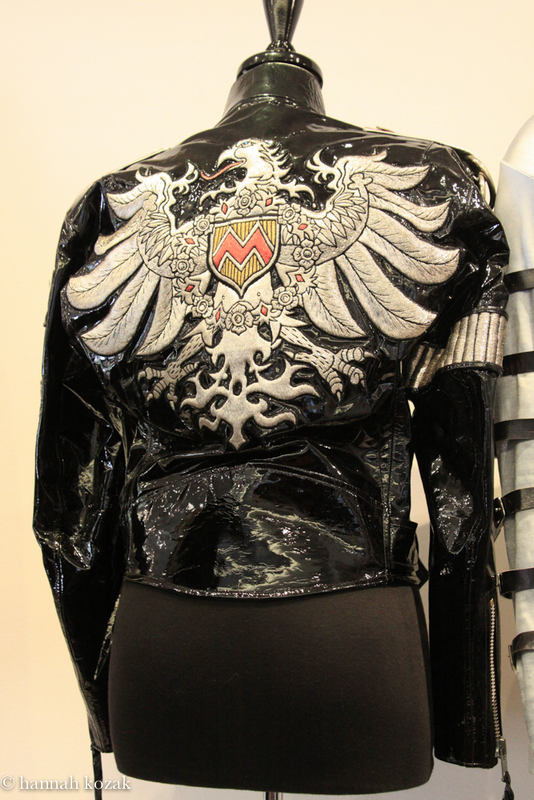 Black leather, zip front jacket w/silver piping detail, large silver tone metal badges down the front. Each badge features an interlinking “V” and “8” and was known as the “V-8” jacket. Interior of the jacket features Tompkins and Bush labels. Michael wore this jacket during photoshoot w/photographer Jonathan Exley which produced the image used on back cover of his Dangerous World Tour souvenir program. A black silk satin jacket with zip front closure, extensive black and white striped ribbon detailing, silver plastic eagle badges at shoulders, merlot silk armband, costume crystal appliques at collar, large French double-headed eagle coin motif buttons. 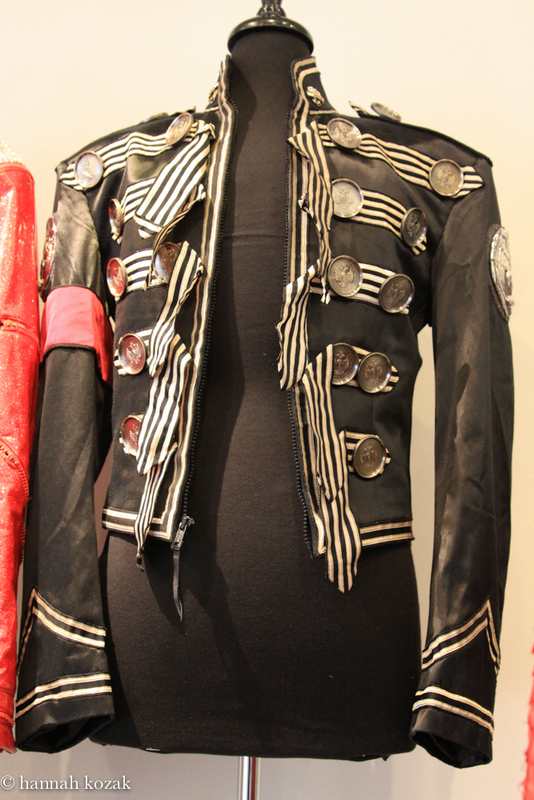 Michael was photographed wearing this jacket while traveling with Lisa Marie Presley. 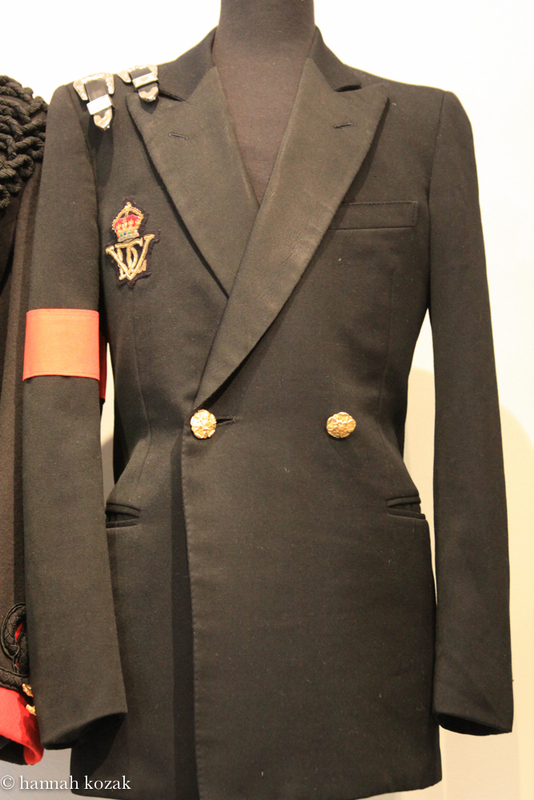 A black wool military style jacket featuring red piping detail at cuffs, red armband and red collar and epaulets that are embroidered in yellow “CTE”. Jacket is accented with a gold tone metal badge at chest with crown over a blue enamel center. 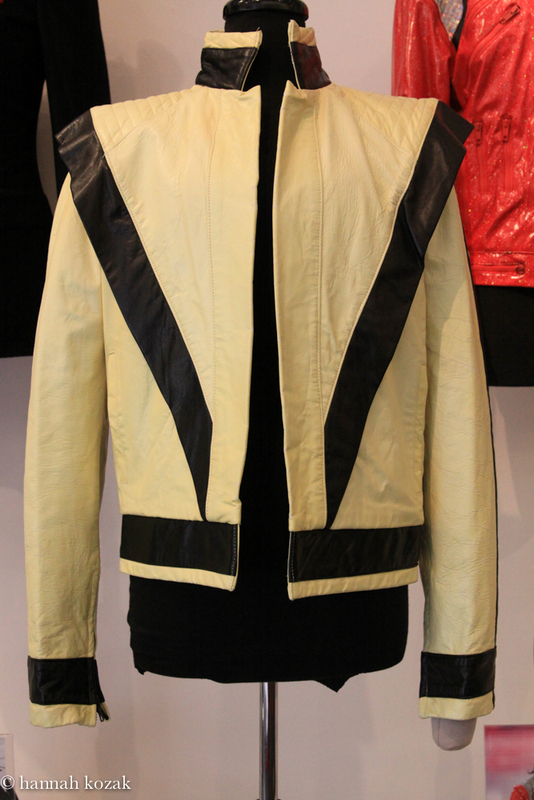 Michael wore this jacket in everyday life during his 1987-1988 Bad World Tour and was photographed wearing the jacket while hugging Motown Founder Berry Gordy during a visit to the Motown Museum in 1988. 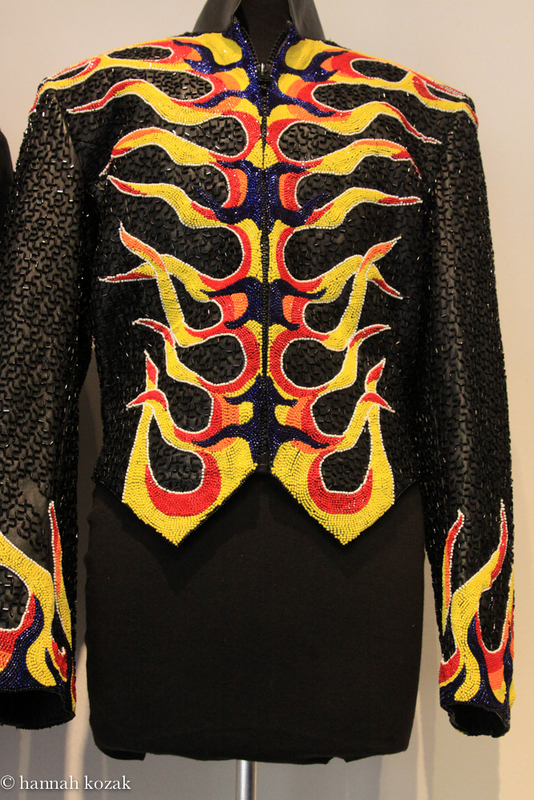 A black leather jacket with front zip closure, completely covered in vermicelli bugle beading with colorful red, yellow, orange, and blue beaded flame embellishment. 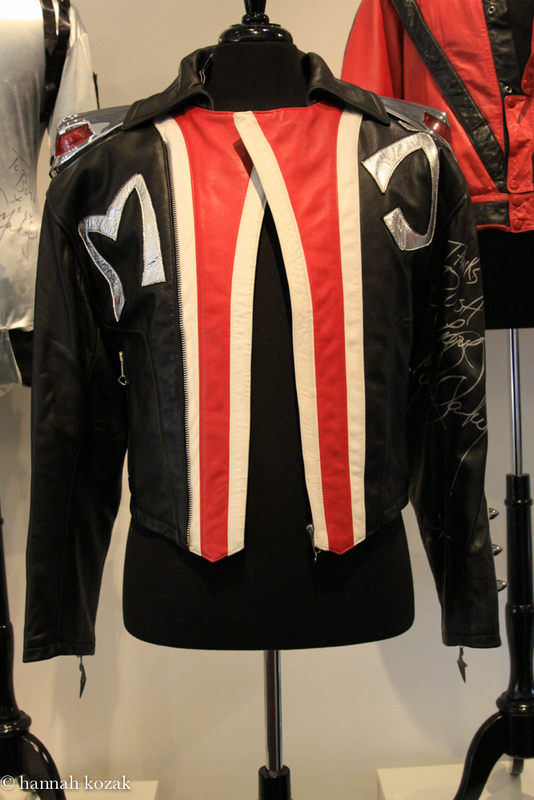 A DayGlo painted leather jacket created by Tompkins and Bush for Michael to wear as her performed Thriller under black lights during the 1992-1993 Dangerous World Tour. A red fish skin, zipper front jacket embellished with black zippers, silver lame shoulder panels completely covered in Swarowski loch rosen crystals. 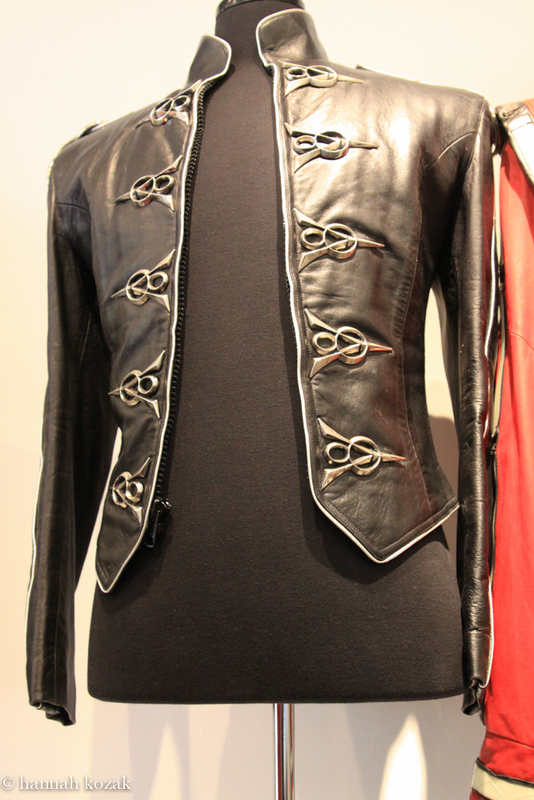 Tompkins and Bush created this jacket for Michael to perform “Beat It” during the 1992-1993 Dangerous World Tour. A cream wool suit jacket completely covered in white vermicelli beading, with faus pearl covered lapel and armband in square black Swarovski crystals. 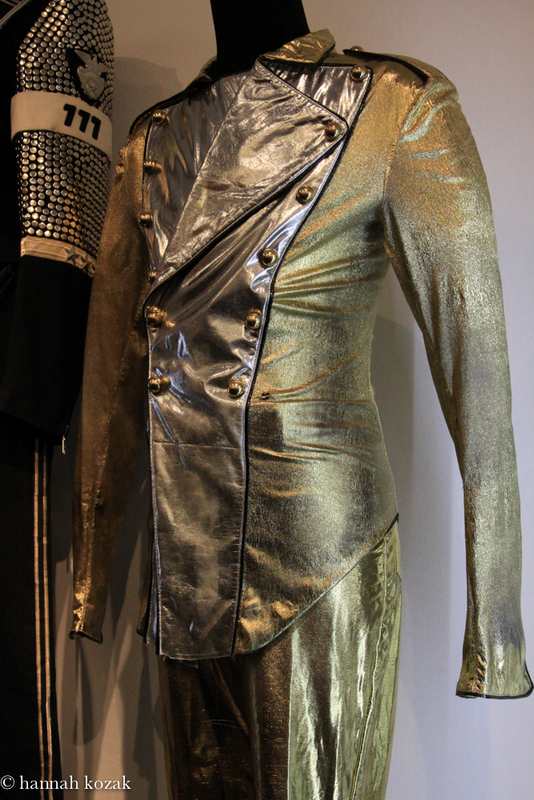 Michael wore this jacket when he escorted Madonna to the 63rd Annual Academy Awards in 1991. 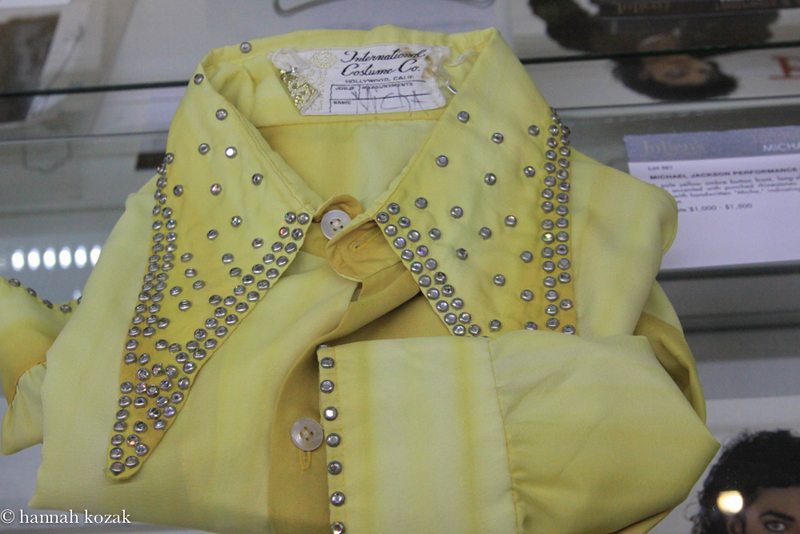 A pale yellow ombre button front, long-sleeve shirt with winged collar and cuffs accented with punched rhinestones. 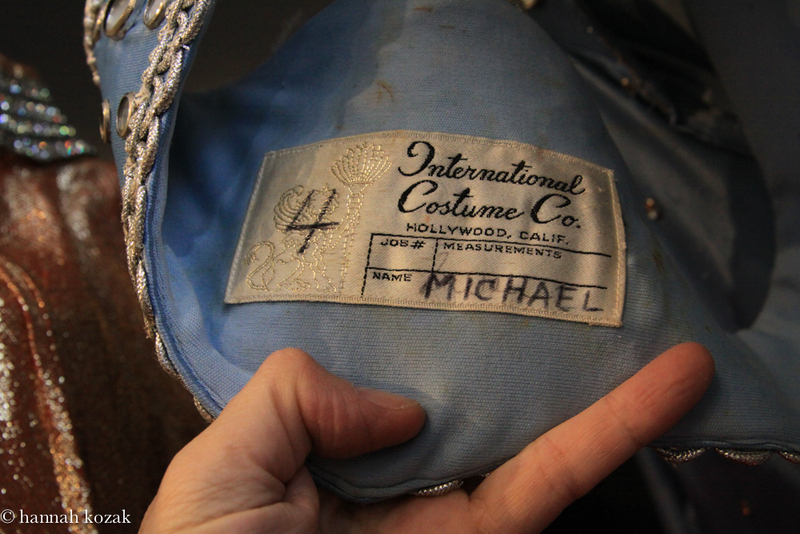 Interior International Costume Co. label with handwritten “Micha”, indicating the the shirt was worn by Michael Jackson. This is one of my favorite items. A belt constructed of 18k gold plated overlapping plates that spell out “Dangerous.”The gold plated belt buckle features a carved resin cartouche with cherubs flanking a carved representation of Earth. 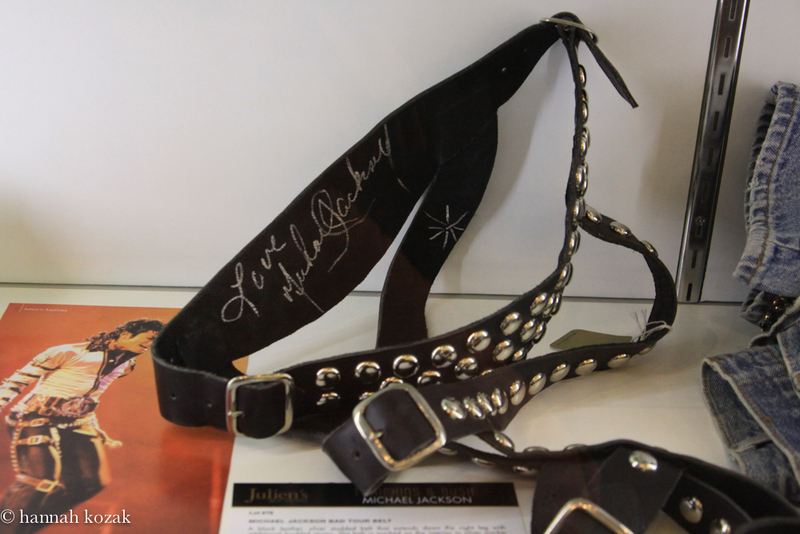 The interior of the belt is signed in blue marker “Love MIchael Jackson.” This belt was created for the Dangerous Tour, but it did not work with his stage outfits and was therefore not used. 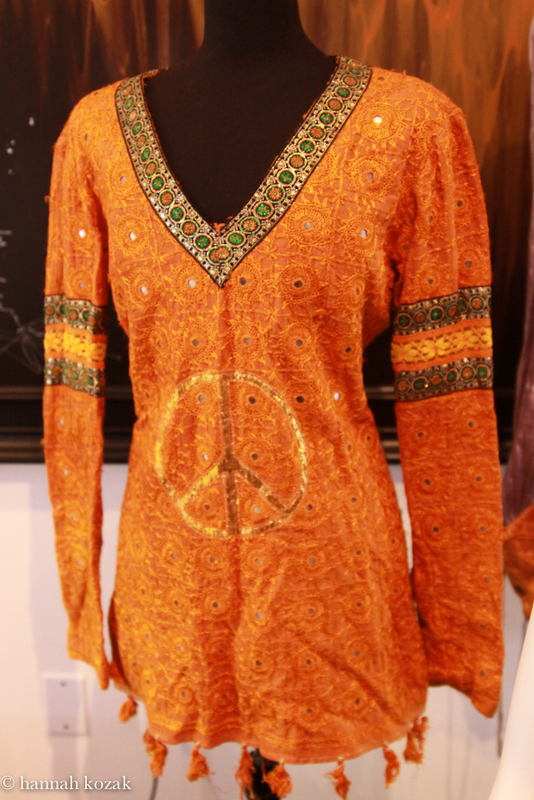 Red synthetic blend tunic with back zipper closure, accented with large grommets, round and star studs. Together with black synthetic blend, tab front flared trousers featuring a row of round studs down the outside seam of each leg. 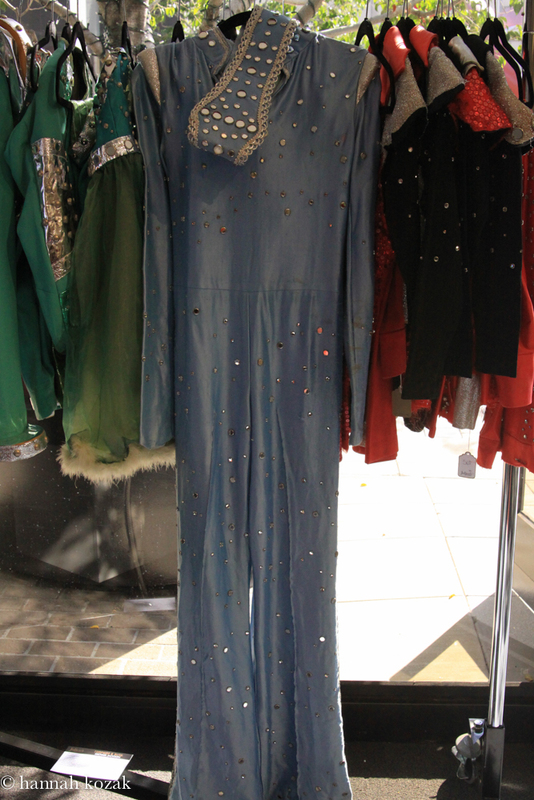 Both pieces feature labels from Cotroneo Costume of Hollywood with “Mike” typed onto each label. 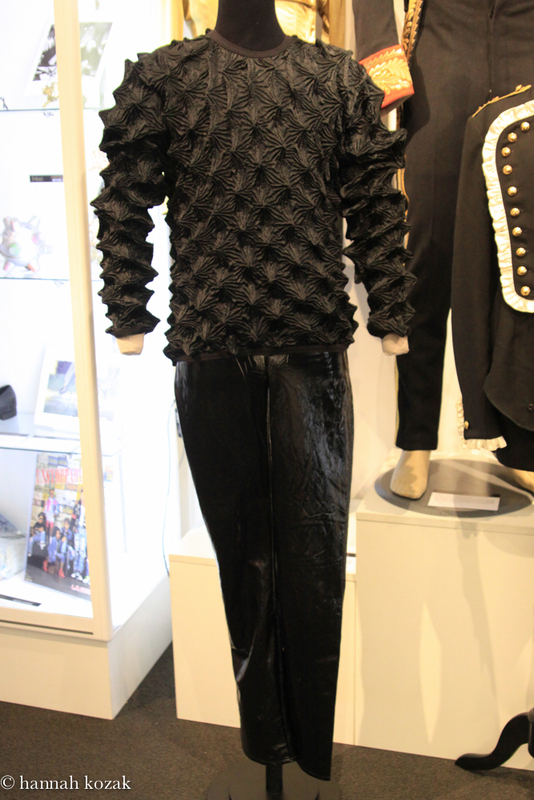 Jackson wore this ensemble as he performed the song at the 45th Annual Academy Awards ceremony in 1973, at 15 years old. Michael Jackson, the boy who loved to explore Disneyland rides at night, write songs while he sat in the branches of an Oak tree, and hand out ice cream sandwiches from his ice cream cart to staff and friends at Neverland, was The King of Pop but even more, he was The King of caring and giving,The King of kindness. 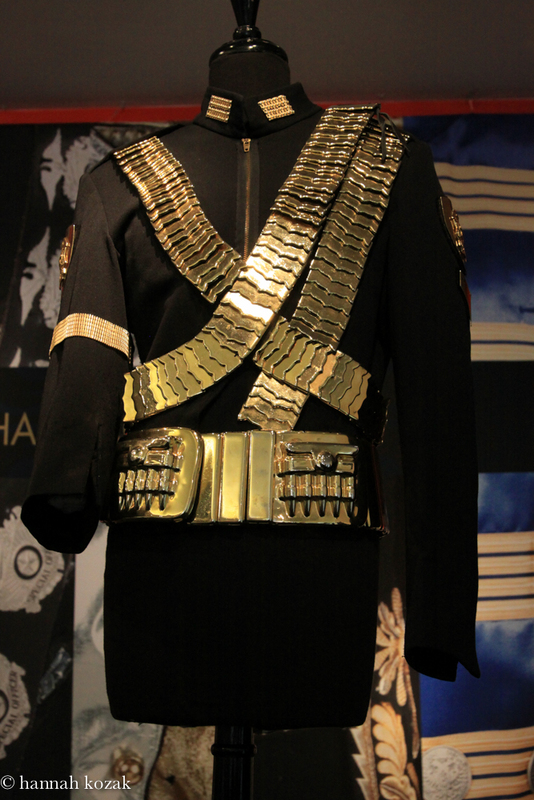 Because of his generosity to Michael Bush, all these costumes are up for display so fans can enjoy them. 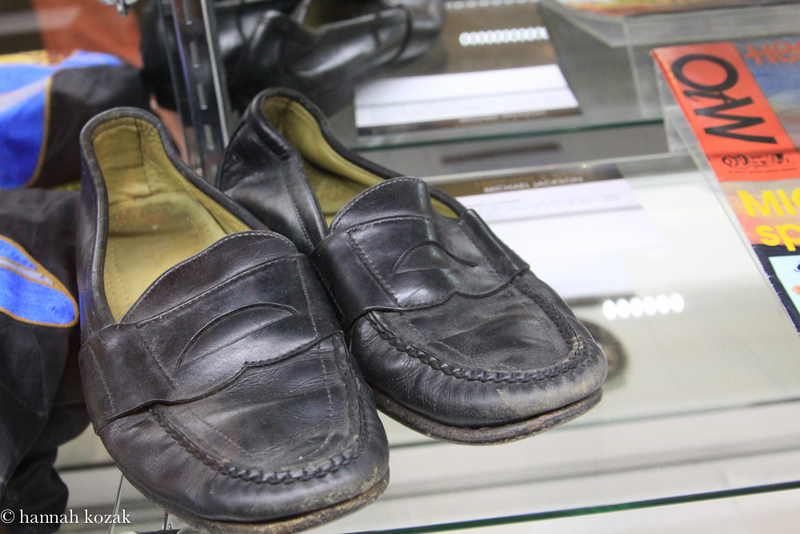 I thought this was a perfect ending for the blog, a pair of shoes that Michael Jackson danced in as he dances in my heart forever. Michael Jackson died on June 25, 2009 causing a shift inside of me. 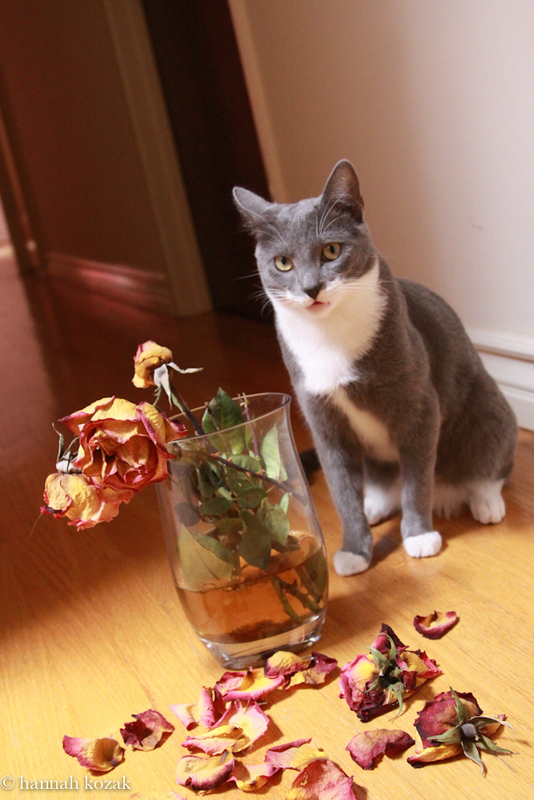 I have delayed reactions to my feelings and emotions and this event affected me no differently. I couldn’t quite process that he died and I was injured at work that same day. I began to research who this loving, heart centered man really was not what the media tried to force-feed us. 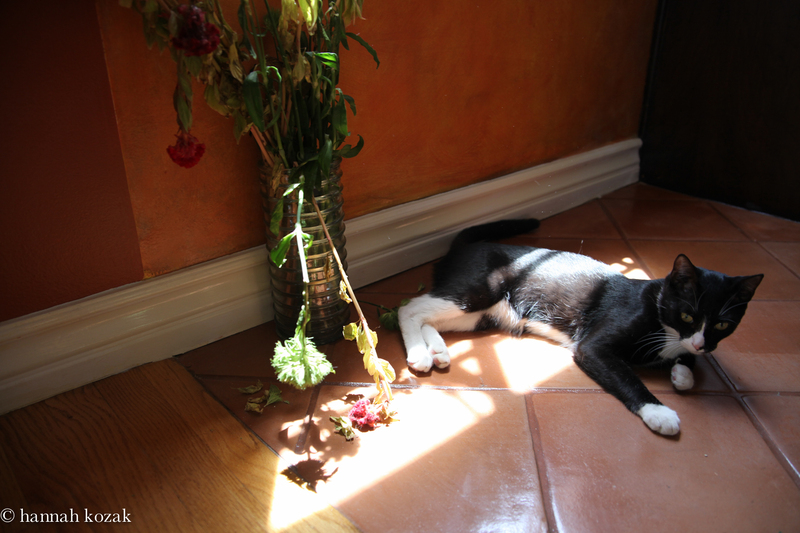 He was unique, filled with sensitivity and compassion and perfect instincts. He was filled with childlike innocence and a pure heart that loved. I learned that Michael Jackson received his inspiration from nature, children, animals and G-d. His faith was unwavering and he walked with God throughout his life. His childhood left him hungry to do for others namely children. This is common among abuse victims. It was part of his destiny. His genius for creativity gave him an amazing depth despite of or was it in part, because of the abuse. The masses judged him because he couldn’t be put into any box. I always loved Michael Jackson from the time I was in grade school. I remember being in the bedroom my 3 brothers shared where the brown veneer wooden Zenith stereo player had a 33 rpm record going around. A friend of mine and I were listening to Going Back to Indiana on the Jackson Five Third Album while dancing around the tiny room and clapping our hands to the rhythm.I was driving around in my 1979 Volvo with white exterior and red leather interior blasting the music on a cassette of Off The Wall from my JBL speakers that I had added on to my little car. In 1982, I would watch Michael, mesmerized as he danced in his videos for Thriller and Billie Jean. I can still see him in that black suit with a pink shirt and red bow tie. He turned the video medium into an art form and owning the Thriller album seemed to be a household staple. Michael’s style was always his own. He was a trendsetter. 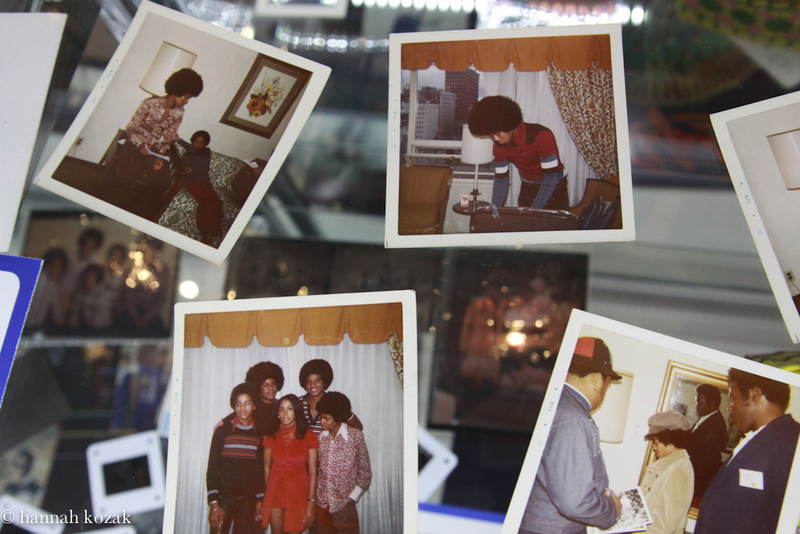 “Mom,” Jermaine used to tease Michael. “Michael is wearing white socks again under his pants and he looks goofy.” The teasing didn’t matter to Michael. He knew exactly what he was doing. He said when he danced, he wanted the focus on his feet so he would add crystals or rhinestones to his socks for stage. He wore what he liked no matter what anyone thought. He deliberately mispronounced “come on” to “cha’mone” when he sang. From 1987’s Bad to 1991’s Dangerous, Michael’s music became the soundtrack to my life. I could escape from reality into a world of Michael’s falsetto singing; a voice with a touch of sadness. Michael always said, “I love you.” “I love you more” when someone else said I love you first. Always. To his family, friends, and especially his fans. He wasn’t afraid to say I Love you. From everything I’ve read about him, this was a man who meant what he said. 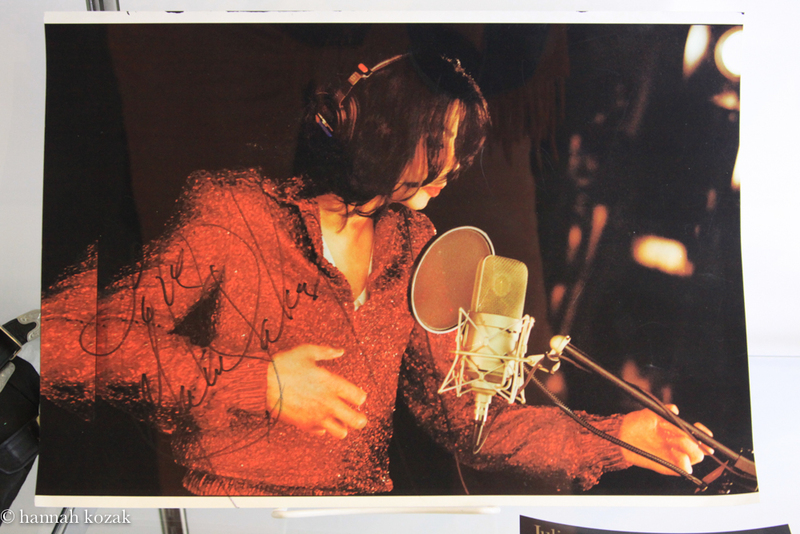 Michael Jackson, in 2007 said, “music has been my outlet, my gift to all of the lovers in the world. Through it, my music, I know I will live forever.” He was a juggernaut that couldn’t be stopped in his desire to gift us with his music, his dance. Late at night alone at the dance studio he had built at Neverland, he would dance at all hours, eventually wearing grooves into the hard wood floor from where his worn black loafers would spin, twist and turn. His music does live on. What lives on for me, and millions of fans all over the world, was his heart, a heart that gave right up to the end. Every night after rehearsals for This Is It, he would stop to speak to fans, sign an autograph or say I love you. 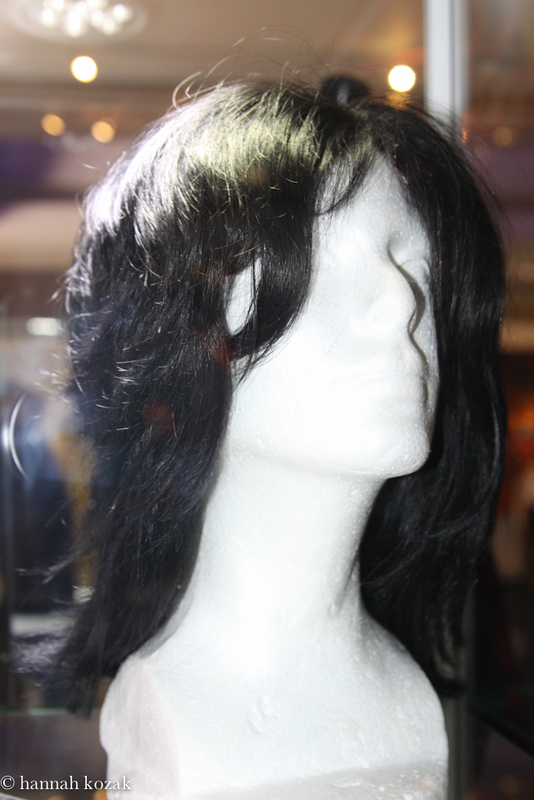 Julien’s Auctions is celebrating the anniversary of Michael’s passing with an auction of a collection of various Michael Jackson pictures, autographs, awards, fedoras, drawings, letters, notes, clothes, costumes even the wig he wore when he announced his final concerts in London, something I found macabre. It’s obvious a lot of the items to be auctioned on the anniversary weekend of 2 years of his passing were gifts to people. 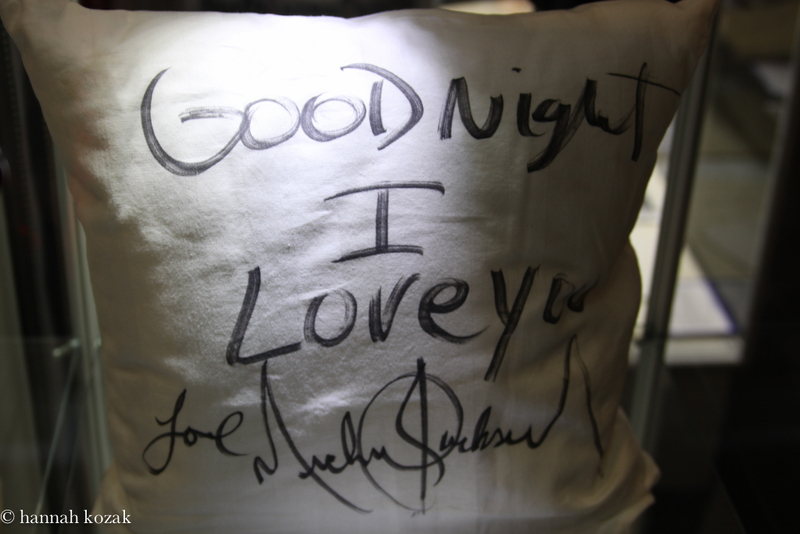 Autographed photos, autographed cd’s or albums, a pillow case where he wrote, “Good night, I love you”. I’ve seen videos where he used to sign a pillowcase from a hotel room and throw it down to the fans. I can understand why these items are being sold. Someone decided not to hold onto it and to sell it. 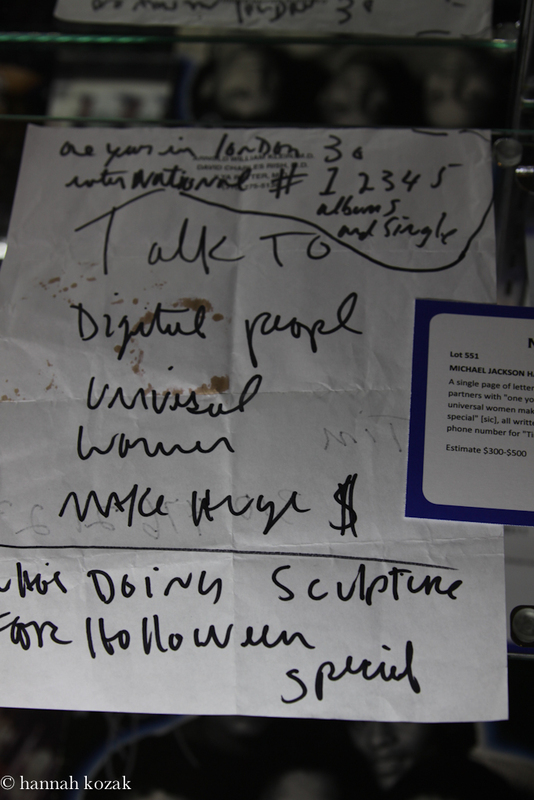 What I don’t understand is selling is what certainly seems to be Michael’s personal effects. Michael was particularly sensitive about the bald spot he had after his scalp was burned in the Pepsi commercial in 1984. When he emerges from a pile of people trying to help him, the entire top of his head was burned, and bald as his hand went immediately to touch it. He would wear a wig to the American Music Awards that year to cover this spot. Wigs would become part of him after this event. It seems to me that selling one of his wigs is in poor taste given how tender this personal issue was for him. It seems clear to me that many of these items were taken from his home in Neverland. When he left for Bahrain in 2005, he realized what he had known for some time. There was a witch-hunt to bring down Michael Jackson. Even thought district attorney Tom Sneddon gave it an earnest attempt by falsifying evidence, nothing could be proven because there was nothing to prove. Michael left his home of eighteen years at Neverland intact with all his possessions. 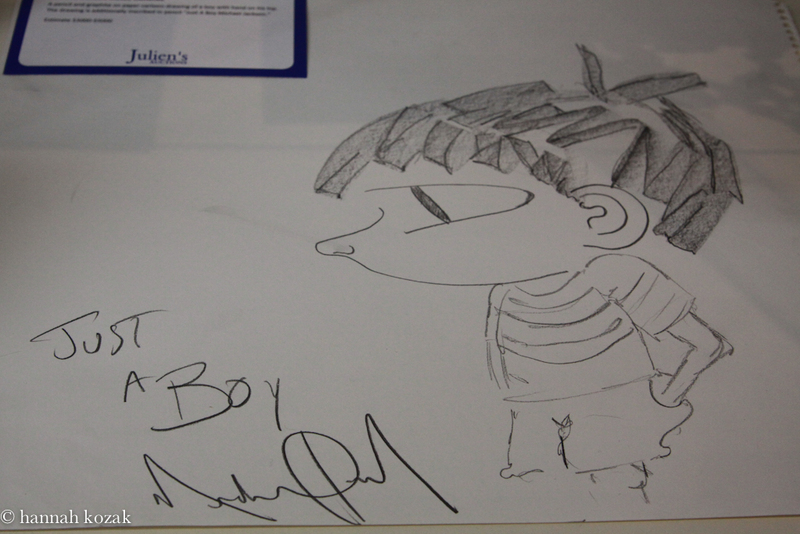 Here’s some photos of drawings he made. These photos are stamped “Nov 1972” and appear to be taken in a hotel room. They look like the type of photos that I have in my family photo album as a kid. They used to stamp the photos like this at Thrifty Drug Store. Looks like personal photos taken from a photo album or a drawer. 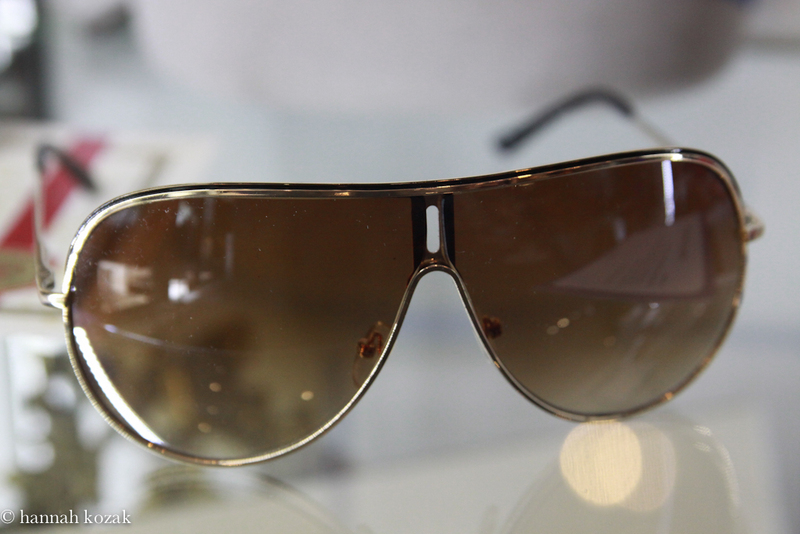 A pair of gold sunglasses Michael wore during the Victory Tour in 1984. 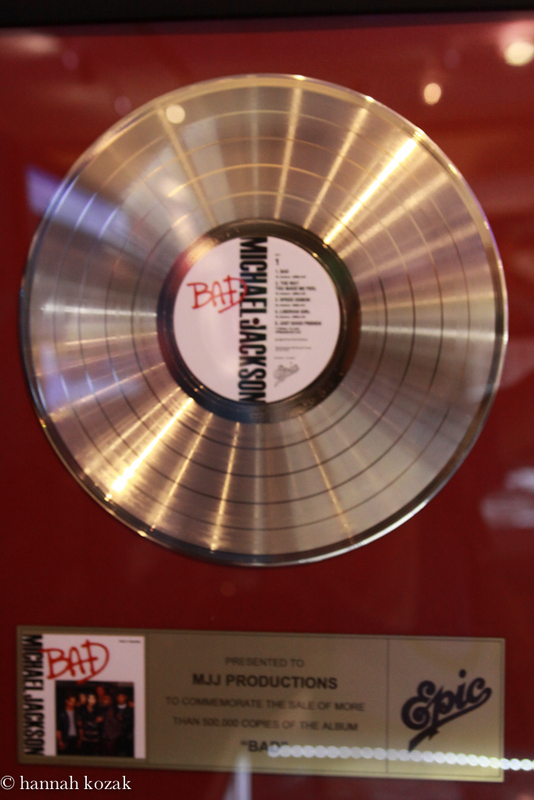 The gold record from Epic Records to commemorate the sales of Bad framed. 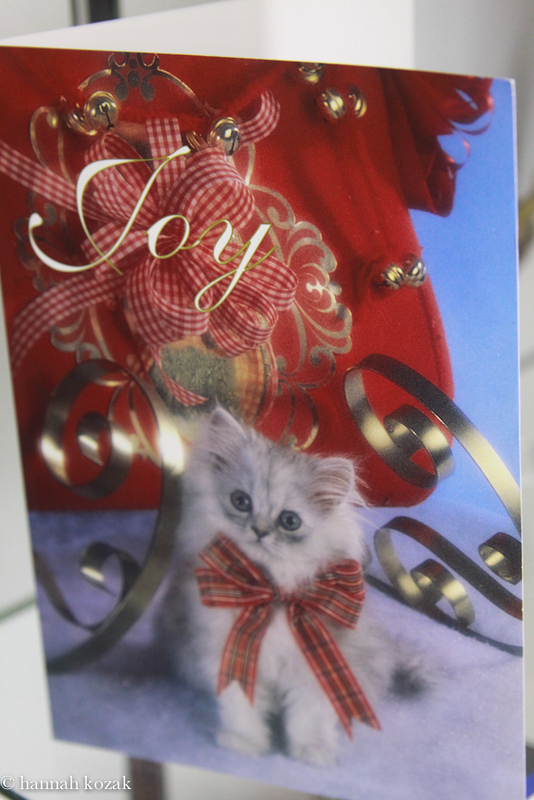 A holiday card that was obviously never sent. 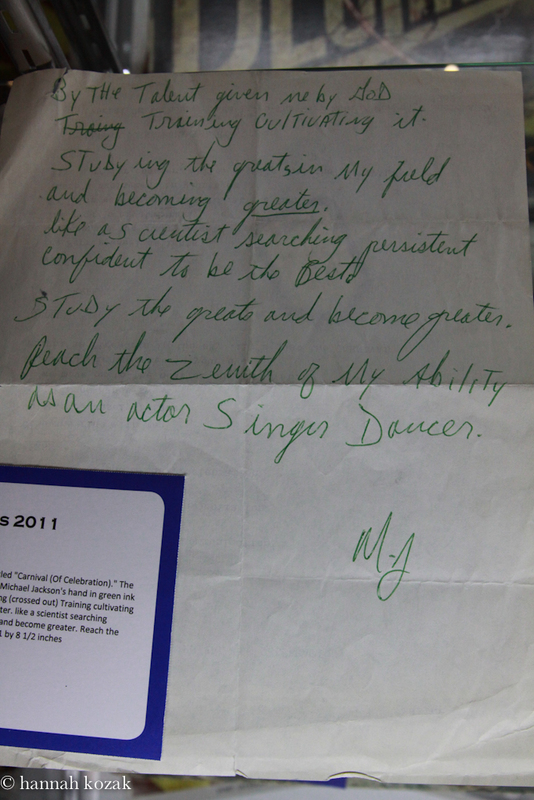 A hand written note that Michael made on a single page of letterhead from Dr. Arnold Klein’s office. There are items here so iconic that I’m puzzled why they are being sold. Okay, this is just my humble opinion but shouldn’t items like this be kept for his children? 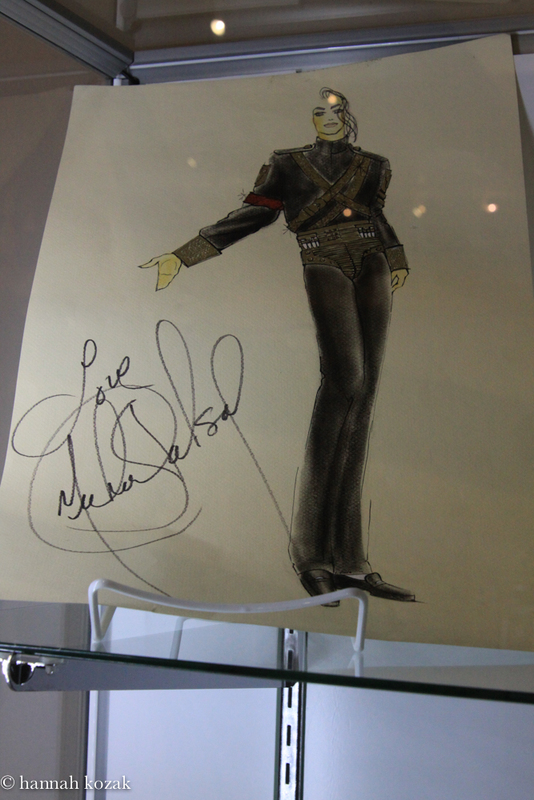 Or at Neverland, which I’ve heard rumors will eventually become a museum of Michael Jackson belongings. 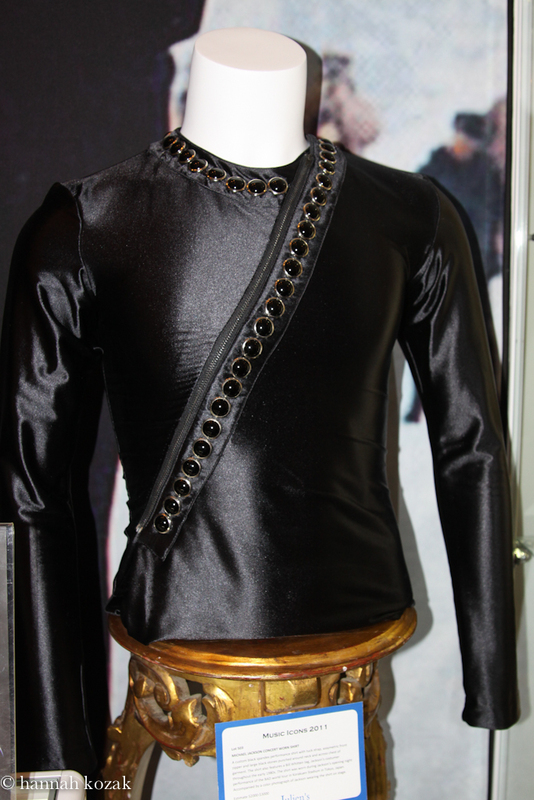 The custom made black spandex shirt with large stones punched around the neck and across the front. 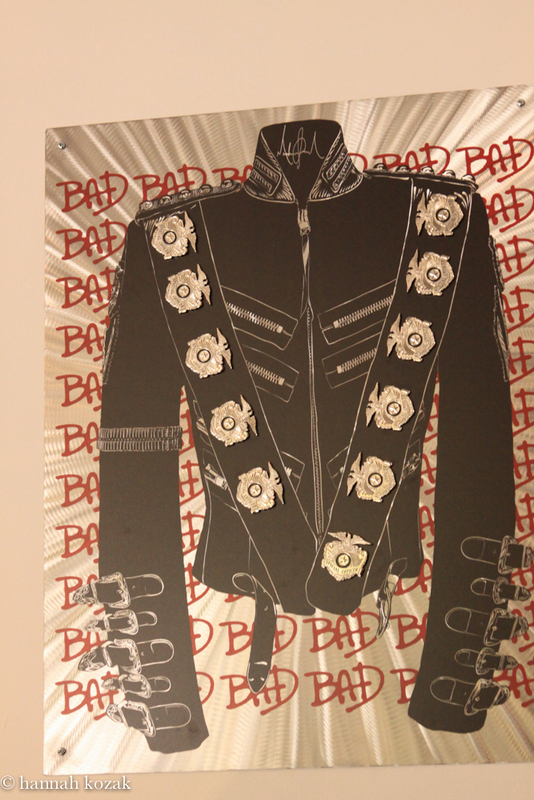 MJ wore this shirt on the opening night of performance of the BAD world tour in Korakuen Stadium in Tokyo, Japan. Julien’s estimates this will sell for between $2000-3000. The black synthetic blend avante garde shirt designed by Dexter Wong featuring elastic neck, waist and cuffs and covered with circular gathered puckers of fabric to create a three dimensional effect. Michael wore this shirt in the ground breaking video “Scream” made with sister Janet. Scream was the most expensive video ever made. 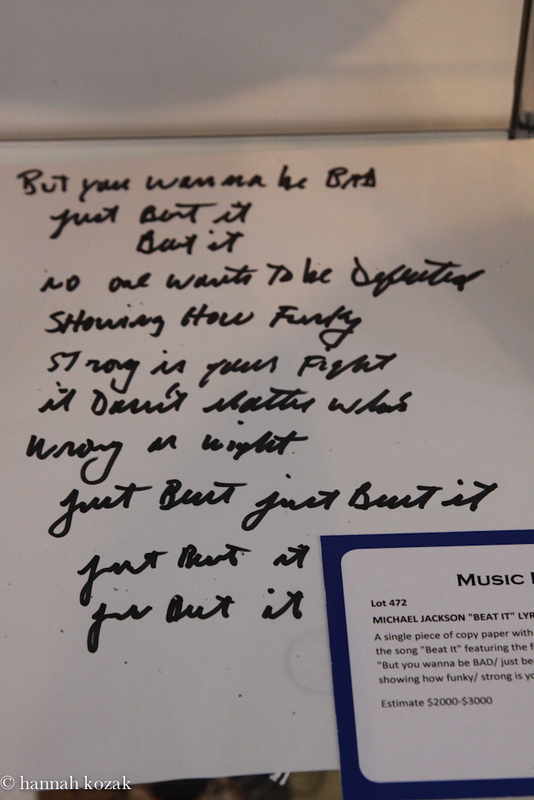 Michael wrote Scream as a response to the backlash he received from the media after being falsely accused of child molestation by a dentist who was relentless in his blackmailing efforts against MJ. 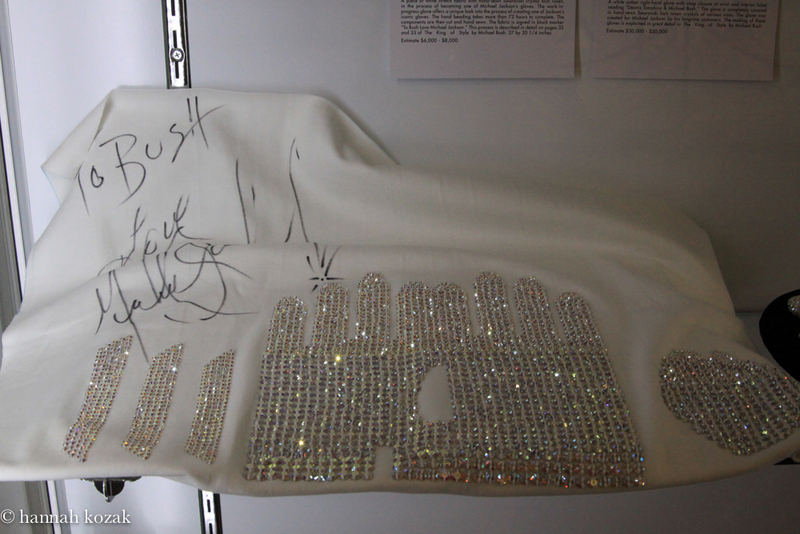 Here is the shirt MJ wore on the Motown twenty-five special on March 23, 1983. Michael was a rising star when this was aired and after that show, he was legendary. A synthetic blend, black long-sleeved shirt with label reading “Mr. Alex Beverly Hills” and the name “Helnsen Michen” typed on the label. 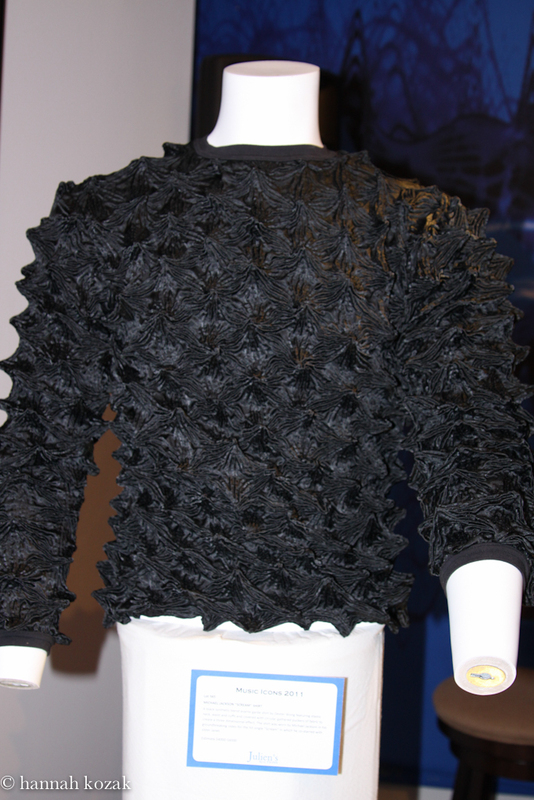 The shirt had been customized with punched rhinestones covering the collar, chest and rolled-up cuffs of the shirt. He wore this shirt first during his performance of the song “Ease On Down The Road” with Diana Ross for her February 2, 1981, CBS TV special. Diana wore a matching version of the shirt as they sang the single from their film The Wiz together. 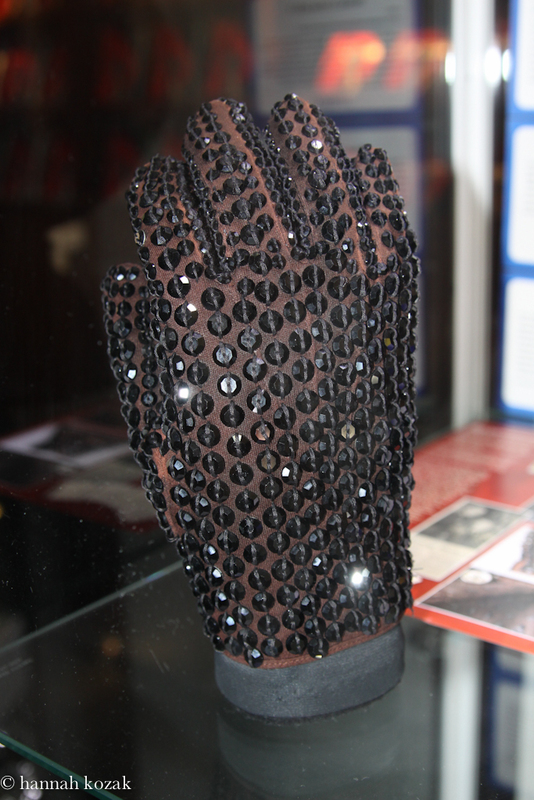 The black sequined glove he wore on The American Music Awards show where he won 8 awards on January 16, 1984. Custom made for his right hand, with hand-sewn black Swarovski crystals with a single snap closure. There are photos of him with Brooke Shields, Lionel Richie, and Emmanuel Lewis wearing this unique glove. What makes this glove unusual is he typically wore white gloves during this period. 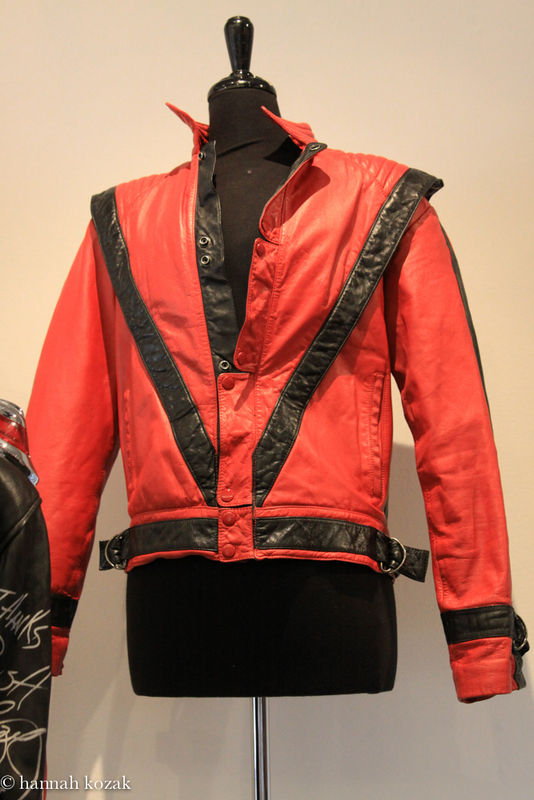 The black and red leather jacket Michael wore in the Thriller video is estimated to sell for between $200,000-400,000 nuts. 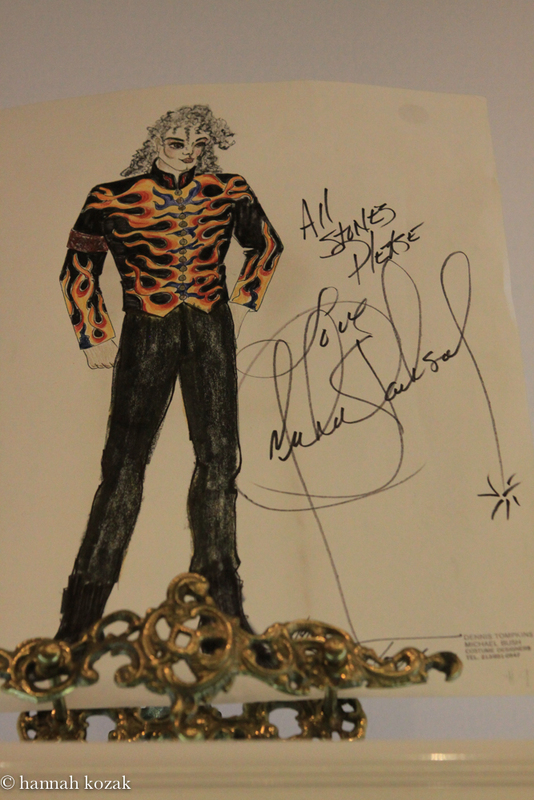 Michael gave this jacket to his longtime costume designers Dennis Tompkins and Michael Bush. It has a “Marc Laurent Paris” label, silver buckle, red silk lining, trapunto stitched collar, snap front closure and signature winged shoulders. 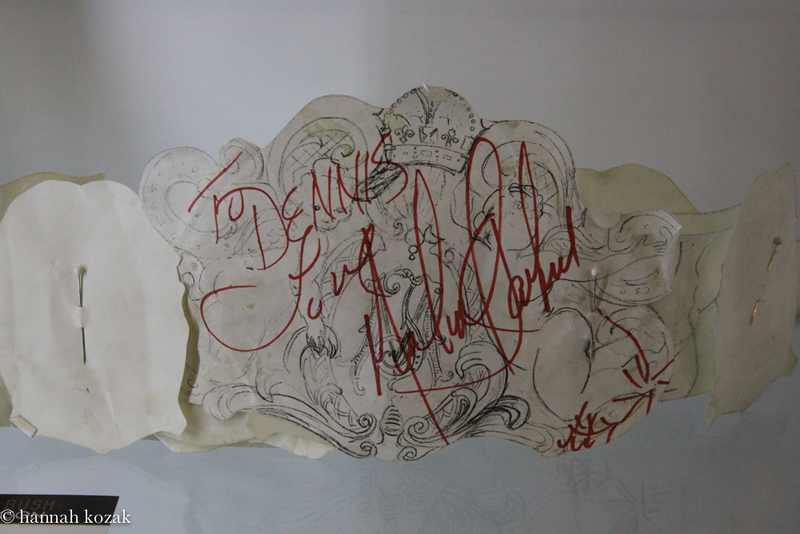 Michael inscribed “To Bush and Dennis, All My Love, Michael Jackson” on the inside lining and the sleeve is also signed “Love Michael Jackson”. 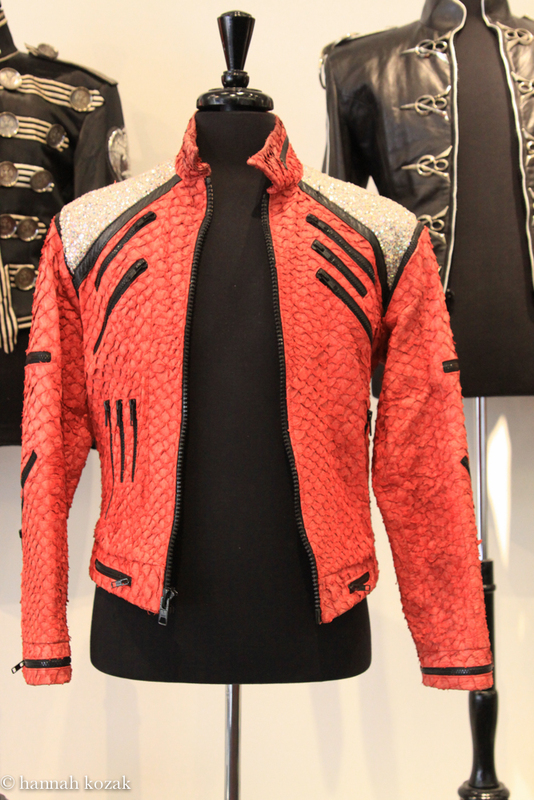 This jacket ignited a nineteen eighties fashion trend and was so much a part of Jackson’s persona that it was used as a reference for all of his subsequent concerts when he danced Thriller. 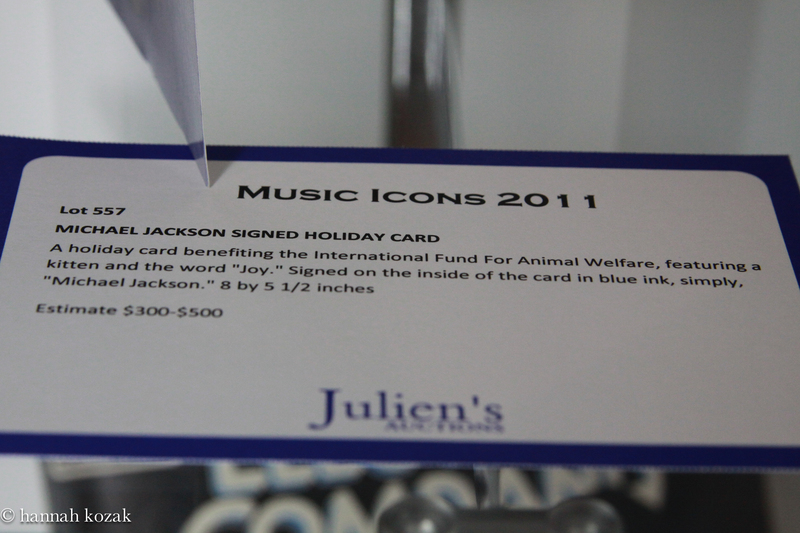 When I first viewed all these items at Julien’s Auctions I felt these items need to be preserved. They are part of musical history. My heart’s desire is that Tom Barrack, owner of Colony Capitol, who saved and is the steward of Neverland, will swoop in and purchase all of these pieces. I will have to let go of the idea of these pieces being on display at Neverland for all the world to see, instead of going into a private home, where perhaps 1 or a few people will enjoy these treasures. Look, I understand. It would be fun to have one of Michael’s gloves. I would like it more knowing many people could enjoy it. What is the purpose of my hanging onto this need? Even though the likes of great talents such as James Brown, Jackie Wilson, Fred Astaire and Gene Kelly inspired Michael, he was a rare, indefinable mega talent onto himself. He didn’t need fifty back up dancers, special effects, and video screens all around. Give the boy a stage and a microphone and he was on fire. He grew up on stage. I grew up watching and listening to him. Even though he is no longer with us, he left us with a part of his soul forever. Michael Jackson is my hero because he channeled all his hurt, sadness and suffering into art. He is my hero because he understood that sweetness and innocence and compassion didn’t make you weak, they make you strong. On June 25, 2009, he left us but only physically. Michael truly embodied the adage of wherever you go in life; it should be a better place because you were there. Gone Too Soon. I love this shirt he wore during the 70’s. MJ always had style.